Lipids are structural components of cellular membranes and signaling molecules that are widely involved in development and diseases, but the underlying molecular mechanisms are poorly understood, partly because of the vast variety of lipid species and complexity of synthetic and turnover pathways. From a genetic screen, we identify that mannosyl glucosylceramide (MacCer), a species of glycosphingolipid (GSL), promotes synaptic bouton formation at the Drosophila neuromuscular junction (NMJ). Pharmacological and genetic analysis shows that the NMJ growth-promoting effect of MacCer depends on normal lipid rafts, which are known to be composed of sphingolipids, sterols and select proteins. MacCer positively regulates the synaptic level of Wnt1/Wingless (Wg) and facilitates presynaptic Wg signaling, whose activity is raft-dependent. Furthermore, a functional GSL-binding motif in Wg exhibiting a high affinity for MacCer is required for normal NMJ growth. These findings reveal a novel mechanism whereby the GSL MacCer promotes synaptic bouton formation via Wg signaling. The glycosphingolipids (GSLs) are particularly abundant in the nervous system and are essential for brain development (Fantini and Yahi, 2015; Yu et al., 2009). Specific deletion of GSLs in mouse brain leads to severe neural defects or lethality (Jennemann et al., 2005). Nevertheless, the molecular and cellular functions of GSLs in development are poorly understood, partially due to the complexity of GSL metabolism and the variety of GSL structures in vertebrates. Because of the comparatively simple metabolic pathways and the power of genetic studies in invertebrates (Bellen and Yamamoto, 2015; Zhu and Han, 2014), a mechanistic understanding of the role of GSLs in development and function of the nervous system is beginning to be established (Dahlgaard et al., 2012; Huang et al., 2016; Kniazeva et al., 2015; Yonamine et al., 2011). GSLs and sphingomyelins (SMs, another class of sphingolipids) assemble with sterol into detergent-resistant membrane microdomains known as lipid rafts, which are critical for signal transduction and membrane trafficking (Lingwood and Simons, 2010). In neural development, multiple processes such as neuronal proliferation, recognition, migration, and synapse formation are regulated by lipid rafts (Aureli et al., 2015). For instance, disruption of rafts by depletion of sphingolipid or sterol leads to enlargement and gradually loss of synapses in cultured hippocampal neurons (Hering et al., 2003). Many growth factors or their receptors are preferentially located within and functionally dependent on membrane rafts (Wang and Yu, 2013; Watanabe et al., 2009; Zhai et al., 2004). Specifically, GSLs interact with raft-associated signaling proteins, such as epidermal growth factor receptor (EGFR) and Notch, thereby facilitating signal transduction (Coskun et al., 2011; Hamel et al., 2010; Wang and Yu, 2013). Our previous study uncovered that the GSL mannosyl glucosylceramide (MacCer) promotes NMJ overgrowth (Huang et al., 2016). However, the mechanisms by which GSLs mediate in vivo neural development remain elusive. Normal brain function depends on proper formation of synaptic connections. The Drosophila larval glutamatergic neuromuscular junction (NMJ) is an advantageous model for dissecting mechanisms underlying synaptic development (Bayat et al., 2011; Khuong et al., 2013; Khuong et al., 2010; Korkut and Budnik, 2009). To uncover potential functions of lipids at synapses, we used the Drosophila NMJ as a model synapse and performed a genetic screen targeting genes involved in lipid biosynthesis and turnover pathways. From this screen, we identified multiple genes involved in sphingolipid de novo synthesis affecting NMJ development. We further found that MacCer is both required and sufficient for promoting NMJ growth and bouton formation in presynaptic neurons. MacCer promotes NMJ growth in a raft-dependent manner. We revealed that MacCer positively regulates synaptic Wg level and the presynaptic activity of Wg signaling. Further multiple independent assays showed MacCer physically interacts with Wg via a previously unidentified GSL-binding motif in Wg. Mutations in this motif disrupt the MacCer-Wg binding and normal NMJ growth. These findings demonstrate that the GSL MacCer plays a crucial role in bouton formation and NMJ growth and uncover a novel regulatory mechanism of Wg signaling pathway by MacCer. To gain novel insights into the role of lipids in regulating synaptic development, we carried out a genetic screen targeting genes involved in the biosynthesis and turnover of fatty acids, glycerophospholipids, and sphingolipids. We tested over 60 candidate genes by examining NMJ morphology (Supplementary file 1) and identified two enzymes, serine palmitoyltransferase 2 Lace and ceramide synthase Schlank, promoting NMJ bouton formation as mutations in either of the two proteins led to fewer and larger boutons (Figure 1B–F,H,I,K). Mutations in lace and schlank disrupt the de novo synthesis of ceramides, the central intermediate in sphingolipid synthesis/metabolism (Figure 1A; Adachi-Yamada et al., 1999; Bauer et al., 2009; Fyrst et al., 2004). These data indicate that depletion in de novo synthesis of ceramides inhibits bouton formation. In addition to the de novo ceramide synthesis, the ceramide precursor sphingosines can be phosphorylated by sphingosine kinase 2 (Sk2) to produce phosphorylated sphingosines (Figure 1A). 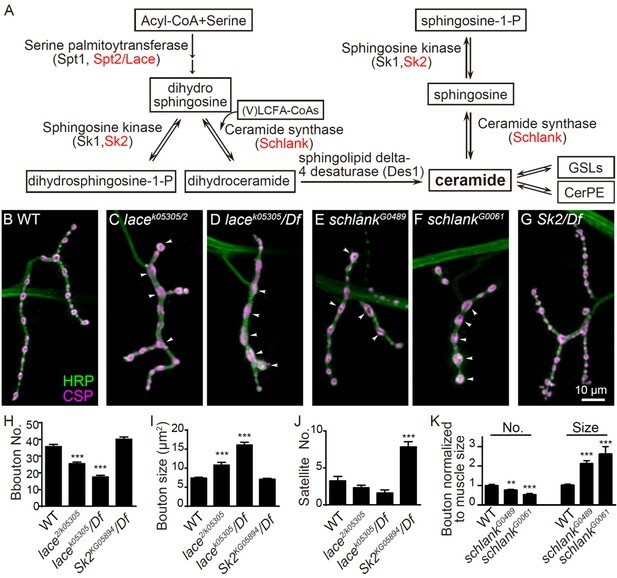 In Sk2 mutants, the level of phosphorylated sphingosines is reduced, while sphingosines accumulate (Fyrst et al., 2004; Yonamine et al., 2011). We found that mutations in Sk2 resulted in more satellite boutons at NMJs (Figure 1G,J), in contrast to the fewer and larger bouton phenotype in lace and schlank mutants. These results indicate that the de novo synthesis of ceramides, their downstream derivatives, or both promote bouton formation and NMJ growth. (A) Simplified de novo biosynthesis pathway of sphingolipid in Drosophila is shown. (B–G) Representative images of NMJ4 co-stained with anti-HRP (green) and anti-CSP (magenta) in wild type (B), lace k05305/lace2 (C), lacek05305/Df(2L)Exel7063 (D), schlankG0489/Y (E), schlankG0061/Y (F) and Sk2KG05894/Df(3L)BSC671 (G). Scale bar: 10 μm; Arrowheads indicate large boutons in different mutants. (H–J) Quantifications of bouton number (H), bouton size (I) and satellite bouton number (J) of NMJs in abdominal segments A3 or A4 of different genotypes. (K) Bouton number and size in schlank mutants were normalized to muscle surface area as schlank mutants showed decreased body size (Bauer et al., 2009). *p<0.05; **p<0.01, and ***p<0.001 by student’s t test between a test genotype and the wild-type control; n ≥ 10 larvae; error bars: s.e.m. Source data 1. Numerical data for the statistical graphs. The following figure supplement is available for Figure 1. GSL and ceramide phosphoethanolamine (CerPE, the Drosophila analogue of SM) are major membrane sphingolipids modified from ceramides (Figure 1A). However, we did not study the effects of CerPE in NMJ growth because there are multiple genes encoding candidates of CerPE synthase in the Drosophila genome (Vacaru et al., 2013); Supplementary file 1). In contrast to the complex CerPE synthesis, the first three steps of GSL synthetic pathway are catalyzed by single GSL synthases in Drosophila (Figure 2A; Chen et al., 2007; Schwientek et al., 2002; Wandall et al., 2003). Disruption of the first one glucosylceramide synthase (GlcT1) to block GSL biosynthesis by feeding larvae with a specific GlcT1 inhibitor D, L-threo-PDMP at 0.5 mg/ml (Delgado et al., 2006) resulted in fewer and larger boutons at NMJ synapses (Figure 2C,N), without affecting the developmental time and larval size (muscle 4 size was normal; Figure 2—figure supplement 1). GlcCer can be further converted into MacCer by Egghead (Egh) (Wandall et al., 2003). It has been previously shown that the enzymatic activity of Egh is reduced in egh62d18 and egh7 mutants (Wandall et al., 2005). Here we show that both homozygous egh62d18 and hetero-allelic egh62d18/egh7 mutants also displayed fewer and larger synaptic boutons (Figure 2,D,O and Figure 2—figure supplement 1; Huang et al., 2016). In contrast, neuronal (presynaptic) overexpression of Egh driven by the pan-neuronal nSyb-Gal4 or motor neuronal specific OK6-Gal4 led to synaptic overgrowth with more and smaller boutons (Figure 2, D–H and O and Figure 2—figure supplement 1 ), indicating that Egh promotes bouton formation. However, expression of egh in muscles (postsynaptic) driven by C57-Gal4 or in glia driven by Repo-Gal4 did not affect NMJ growth in both wild type and egh62d18 mutant background (Figure 2—figure supplement 2). 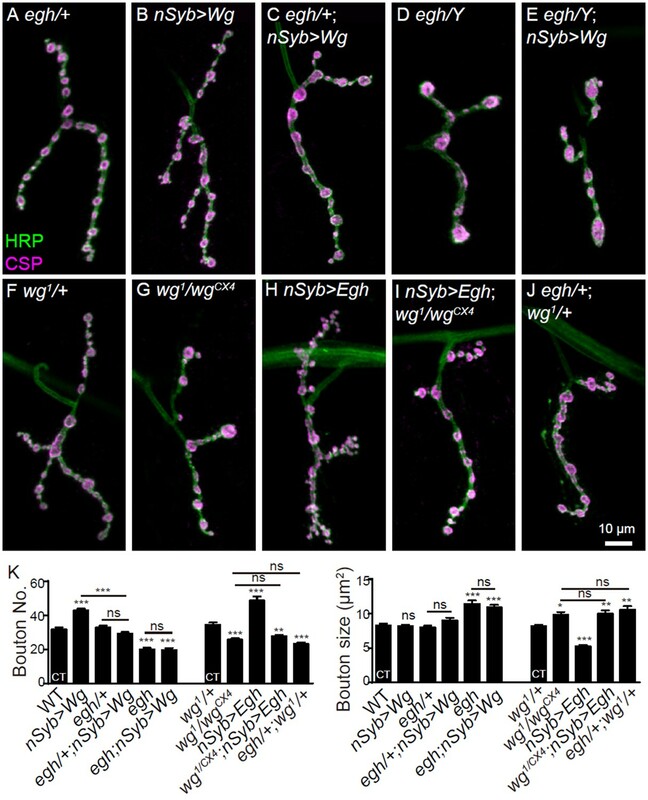 The cell-type specific manipulations of egh expression support that Egh promotes NMJ bouton formation in presynaptic motoneurons. Heterozygous mutation of egh significantly suppressed NMJ overgrowth in larvae neuronal overexpressing Egh, and homozygous mutation of egh in Egh-overexpressing background fully suppressed bouton number but not bouton size to the control level (Figure 2O), indicating that neuronal expression of egh promotes NMJ growth in a dose-dependent manner. Brainiac (Brn) converts MacCer to GlcNAc-MacCer (Figure 2A; Schwientek et al., 2002). Hypomorphic brnfs.107 and brn1.6P6 mutants display MacCer accumulation in egg chambers (Pizette et al., 2009; Wandall et al., 2005). We observed more boutons and satellite boutons in homozygous brnfs.107 and trans-allelic brn1.6P6/brnfs.107 mutants; neuronal knockdown of brn by an RNAi under the control of nSyb-Gal4 or OK6-Gal4 also resulted in NMJ overgrowth. Conversely, neuronal overexpression of Brn driven by nSyb-Gal4 or OK6-Gal4 led to fewer and larger boutons (Figure 2, I–M and P; Huang et al., 2016), recapitulating the phenotype of egh mutants. Furthermore, overexpression and knockdown of brn in muscles by C57-Gal4 or in glia by Repo-Gal4 did not affect NMJ growth (Figure 2—figure supplement 2). The cell type specific rescue and RNAi knockdown results demonstrate that both Egh and Brn act presynaptically. The opposite effect of Egh and Brn in regulating bouton number suggests that the GSL MacCer promotes NMJ growth. (A) GSL synthesis pathway in Drosophila. (B–M) Images of NMJ4 co-stained with anti-HRP (green) and anti-CSP (magenta) in wild type (B), larvae treated with 0.5 mg/ml D, L-threo-PDMP (C), egh62d18/Y (D), UAS-Egh/+; nSyb-Gal4/+ (E), egh62d18/Y; UAS-Egh/+; nSyb-Gal4/+ (F), UAS-Egh/OK6-Gal4 (G), egh62d18/Y; UAS-Egh/OK6-Gal4 (H) brn fs107/brn1.6P6 (I), UAS-brn-RNAi/+; nSyb-Gal4/+ (J) nSyb-Gal4/UAS-brn (K), UAS-brn-RNAi/OK6 Gal4 (L), and OK6-Gal4/+; UAS-brn/+ (M). Scale bar: 10 μm; Arrowheads point at large boutons. (N–P) Quantifications of total bouton number, bouton size, and satellite bouton number of NMJs in different genotypes or treated with PDMP. ‘CT’ denotes corresponding control in each multiple comparison. *p<0.05; **p<0.01, ***p<0.001 by one-way ANOVA with Tukey post hoc tests; n ≥ 12 larvae; error bars: s.e.m. To verify if MacCer indeed promotes NMJ growth, we performed immunostaining and found that endogenous MacCer, detected by a specific anti-MacCer antibody (Wandall et al., 2003), was enriched at presynaptic NMJ boutons in a punctate pattern (Figure 3A). Compared to wild type, MacCer intensity at NMJs was reduced in egh mutant and brn-overexpressing larvae; conversely, MacCer intensity was increased at NMJs of brn mutant, brn RNAi knockdown, and egh-overexpressing larvae (Figure 3, B–H), demonstrating the specificity of the anti-MacCer. These findings are consistent with previous reports showing that MacCer is decreased in egh mutants but increased in brn mutants by high performance thin layer chromatography (Hamel et al., 2010; Wandall et al., 2005), which we confirmed (Figure 8—figure supplement 1). Based on the fact that the presynaptic MacCer levels positively correlate with synaptic bouton number, we conclude that the GSL MacCer promotes NMJ growth presynaptically. 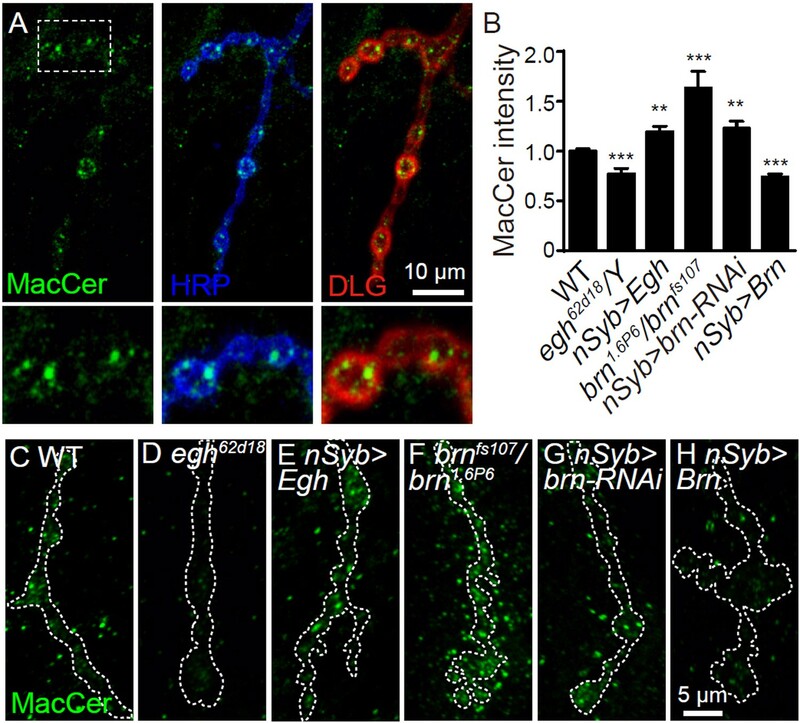 MacCer staining intensity at NMJs is bi-directionally regulated by Egh and Brn. (A) Images of wild-type NMJ4 co-stained with anti-MacCer (green), anti-HRP (blue) and anti-DLG (red).MacCer puncta were apparent in presynaptic boutons. Scale bar: 10 μm. (B) Statistical results of normalized intensities of MacCer against anti-HRP staining within presynaptic boutons in different genotypes. **p<0.01 and ***p<0.001 by student’s t test between a test genotype and wild type; n ≥ 16 larvae; error bars: s.e.m. (C–H) Representative images of NMJ4 stained with anti-MacCer in wild type (C), egh62d18/Y (D), UAS-Egh/+; nSyb-Gal4/+ (E), brn1.6P6/brnfs107 (F), UAS-brn-RNAi/+; nSyb-Gal4/+ (G) and nSyb-Gal4/UAS-Brn (H). Scale bar: 5 μm. To characterize the synaptic structure in MacCer-deficient NMJs, we examined a few molecules that play important roles in synaptic growth and function, including the cell adhesion molecule Fasciclin II (Fas II) and SNARE protein Syntaxin 1A (Syx1A) (Schulze et al., 1995; Schuster et al., 1996). The synaptic levels of Fas II and Syx1A were not visibly affected in egh mutant and brn-overexpressing NMJs (Figure 3—figure supplement 1). GSLs are constituents of lipid rafts that are detergent-resistant membrane microdomains composed of sphingolipids, sterols and proteins. Like other GSLs, Drosophila MacCer is enriched in detergent-insoluble membrane microdomains (Rietveld et al., 1999). Consistently, MacCer substantially overlaps with Syx1A, a lipid raft-localized protein in human and Drosophila cells (Chamberlain et al., 2001; Zhai et al., 2004), at NMJs (Figure 4A). Our results also show that mutations in lace and schlank result in fewer boutons at NMJs (Figure 1), probably due to a disruption of lipid rafts by depleting total sphingolipids. Thus, we asked if synaptic development requires the formation of lipid rafts. The assembly of lipid rafts is sterol-dependent (Lingwood and Simons, 2010); sterol depletion by methyl-β-cyclodextrin (MβCD), a cyclic oligosaccharide that absorbs sterols from the membrane, efficiently disrupts raft assembly in mammalian cells and Drosophila cells (Sharma et al., 2004; van Zanten et al., 2009; Zhai et al., 2004). Drosophila does not synthesize but takes sterols from food (Carvalho et al., 2010). Thus we used drug treatment rather than genetic means to deplete sterols. Feeding wild-type larvae with MβCD at concentrations higher than 25 mM led to early larval lethality, while MβCD treatment at 20 mM led to a mild developmental delay but normal larval and muscle size (Figure 4—figure supplement 1). MβCD treatment significantly reduced the co-localization of MacCer and Syx1A (Figure 4, B and C). We also treated larvae with another sterol binding drug filipin at 50 μg/ml, which did not affect larval developmental time but led to a mild but significant decrease in muscle size (Figure 4—figure supplement 1). Treatments with both drugs resulted in obviously fewer and larger boutons at NMJs, recapitulating the NMJ phenotype of sphingolipid- and MacCer-deficient larvae (Figure 4, D–G and Figure 4—figure supplement 1). These results suggest that a proper level of sterols is required for bouton formation. Sterol-depletion inhibits NMJ growth in a common genetic pathway with MacCer. (A and B) Confocal images of single slice of NMJ4 boutons triple-labeled with anti-MacCer (red), anti-Syx1A (green) and anti-HRP (blue) in wild type with or without 20 mM MβCD treatment. Plot profiles of the relative intensity along the dashed lines are shown. (C) Pearson’s coefficients of colocalization between MacCer and Syx1A. n = 63 and 52 boutons from eight wild-type larvae each with or without MβCD treatment. (D–F) Images of NMJ4 co-labeled for anti-HRP (green) and anti-CSP (magenta) in untreated wild type (D), wild type treated with 20 mM MβCD (E), wild type treated with 50 μg/ml filipin III (F), Scale bar: 10 μm. (G) Quantification of bouton number and bouton size of NMJs. ns, no significance, ***p<0.001 by one-way ANOVA with Tukey post hoc tests, error bars: s.e.m. (H–M) Images of NMJs from larvae stained with anti-MacCer of wild type (H), wild type treated with 20 mM MβCD (I), UAS-Egh/+; nSyb-Gal4/+ (J), and UAS-Egh/+; nSyb-Gal4/+ treated with 20 mM MβCD (K), wild-type larvae treated with vehicle DMSO (L) or 50 μg/ml filipin III (M). Scale bar: 5 μm. (N) Quantification of MacCer intensities normalized to HRP intensities in different genotypes. ns, no significance; **p<0.01 by one-way ANOVA with Tukey post hoc tests; n ≥ 12 larvae; error bars: s.e.m. Depleting sterol with MβCD in egh-overexpressing background fully restrict the NMJ overgrowth to the level of the wild-type larvae treated with MβCD. Moreover, MβCD treatments in sphingolipid-deficient lacek05305/Df mutants and MacCer-deficient larvae (egh62d18 and nSyb-Gal4/UAS-brn) did not exacerbate the NMJ phenotype (Figure 4G, and Figure 4—figure supplement 1), suggesting that sterol may modulate NMJ growth in a common genetic pathway with sphingolipids and MacCer. We then determined if MβCD treatment suppresses NMJ growth via directly reducing the MacCer level. We found that MβCD completely suppressed the NMJ overgrowth without detectably reducing the synaptic MacCer level in wild-type and Egh-overexpressing larvae; similarly, Filipin treatment did not affect the synaptic level of MacCer (Figure 4, H–N).These data suggest that restriction of synaptic growth by MβCD may be due to defects of MacCer function by disrupting raft assembly rather than a reduction in the synaptic level of MacCer per se. This finding is consistent with a previous report that disrupting the formation of membrane rafts may compromise the function of raft-associated factors but not necessarily affecting their levels; more specifically, the localization of a raft protein LFA-1 was unaltered examined by confocal microscopy at subcellular level but altered by single-molecule near-field optical microscopy at molecular level upon raft disruption (van Zanten et al., 2009). Together, these data suggest that the NMJ growth-promoting effect of MacCer depends on normal lipid rafts. NMJ development is controlled in part by growth factors and pathways (Bayat et al., 2011; Harris and Littleton, 2015; Korkut and Budnik, 2009). Bone morphogenic protein (BMP) is an important growth promoting signaling in NMJs (Bayat et al., 2011). However, we found that the NMJ growth-promoting effect of MacCer is not mediated through the BMP signaling pathway (Huang et al., 2016). Wnt1/Wingless (Wg) activates another signaling pathway promoting NMJ growth (Korkut and Budnik, 2009). Because Wg is a lipid raft-associated protein (Zhai et al., 2004), we further investigated if Wg signaling play roles in MacCer-mediated NMJ growth. Previous reports showed that loss-of-function mutations of Wg signaling components, including the ligand Wg, the receptor dFrizzled2 (Fz2), the co-receptor Arrow (Arr), and the Wg-binding protein Evenness Interrupted/Wntless (Evi/Wls), decrease synaptic bouton number, while overexpression of Wg in motor neurons results in synaptic overgrowth (Korkut et al., 2009; Miech et al., 2008; Packard et al., 2002). In addition, the proper secretion, binding with the receptor Frizzled, and activation of Wg requires lipidation at the conserved serine at amino acid 239 (Janda et al., 2012; Takada et al., 2006). Specifically, the synaptic level of Wg and the downstream signaling are positively regulated by the acyltransferase Porcupine (Packard et al., 2002), which activates the lipidation and raft-association of Wg (Zhai et al., 2004). We hypothesized that the NMJ growth-promoting effect of Wg depends on its association with membrane rafts. Indeed, raft disruption by MβCD treatment which depletes sterol significantly reduced Wg staining intensity at NMJs and constrained NMJ overgrowth in Wg-overexpressing larvae (Figure 5—figure supplement 1), suggesting that normal Wg signaling at NMJs requires intact lipid rafts. Next, we determined whether Wg signaling cooperates with MacCer in promoting NMJ growth. Genetic analysis showed that loss of one copy of egh62d18 had no effect on NMJ morphology but fully suppressed the NMJ overgrowth phenotype of Wg-overexpressing larvae. Homozygous mutation of egh or overexpression of brn on a Wg-overexpressing background led to a decrease in bouton number, recapitulating the phenotype of egh mutants and brn-overexpressing larvae (Figure 5, A–E, K and Figure 5—figure supplement 1). These results together indicate that the NMJ growth-promoting effect of Wg signaling depends on the proper level of MacCer. Conversely, mutation in wg1/wgCX4 restricted NMJ overgrowth in Egh-overexpressing larvae to the wg mutant level (Figure 5, G–I and K). In addition, although bouton number was normal in wg1 and egh62d18 single heterozygotes (wg1/+and egh62d18/+), there were fewer and larger boutons in egh62d18/+; wg1/+ transheterozygotes. Similarly reduced bouton numbers were observed in egh62d18/+; arrk08131/+and egh62d18/+; evi2/+ transheterozygotes (Figure 5, J, K and Figure 5—figure supplement 1), suggesting that Egh and Wg signaling act in the same genetic pathway. Together, these results demonstrate that MacCer works synergistically with Wg signaling in promoting NMJ growth and bouton formation. MacCer is required for the NMJ growth-promoting effect of Wg signaling. (A–J) Representative images of NMJ4 co-stained with anti-HRP (green) and anti-CSP (magenta) in egh62d18/+ (control, (A), UAS-Wg-HA/+; nSyb-Gal4/+ (B), egh62d18/+; UAS-Wg-HA/+; nSyb-Gal4/+ (C), egh62d18 (D), egh62d18; UAS-Wg-HA/+; nSyb-Gal4/+ (E), wg1/+ (F), wg1/wgCX4 (G), nSyb-Gal4/UAS-Egh (H), wgCX4,UAS-Egh/wg1; nSyb-Gal4/+ (I), and egh62d18/+; wg1/+ (J).Scale bar: 10 μm. (K) Quantifications of bouton number and bouton size of NMJs in different genotypes. ‘CT’ denotes corresponding control in each multiple comparison. n ≥ 12 larvae; ns, no significance, *p<0.05; **p<0.01; ***p<0.001 by one-way ANOVA with Tukey post hoc tests, error bars: s.e.m. To reveal the molecular mechanism by which MacCer promotes NMJ growth via Wg signaling, we first examined if there was colocalization between MacCer and Wg. Indeed, a substantial overlap between MacCer and Wg immunoreactivity was observed in NMJ boutons (Figure 6A and E). It is known that Wg secretion from presynaptic terminals requires the recycling endosomal small GTPase Rab11 (Koles et al., 2012; Korkut et al., 2009). It is also known that recycling endosomes are enriched with components of lipid rafts including Lactosylceramide (LacCer), the vertebrate analog of MacCer (Balasubramanian et al., 2007; Gagescu et al., 2000; Hortsch et al., 2010). Consistently, we found strong colocalization of MacCer with Rab11 at NMJ terminals (Figure 6, C and E). In contrast, MacCer puncta did not overlap with the early endosomal marker Rab5-YFP or the late endosome protein Spinster-GFP (Spin-GFP). Although GSLs are synthesized in the Golgi apparatus, there were few overlaps between MacCer and the Golgi marker Mannose II-GFP (Figure 5—figure supplement 1). MacCer is required for the local presynaptic Wg signaling at NMJs. (A–D) Confocal images of single slice of NMJ4 boutons triple-labeled with anti-MacCer (red), anti-HRP (blue) and anti-Wg (green; A–B) or anti-Rab11 (green; C–D) in wild type and egh62d18 mutants. MacCer puncta showed substantial colocalization (arrowheads) with Wg and Rab11 in boutons. Arrows indicate Rab11-positive puncta without MacCer staining in the egh62d18 mutants. Images were processed by deconvolution. Scale bar: 2 μm. (E) Pearson’s coefficients of colocalization between MacCer and indicated proteins. n = 51 and 44 boutons (from ten wild-type larvae each) for colocalization of MacCer with Wg and Rab11, respectively. (F–H) Representative images of NMJ4 co-labeled with anti-Wg (green) and anti-HRP (magenta) in wild type (F), egh62d18 mutants (G) and UAS-Egh/+; nSyb-Gal4/+(H). Scale bar: 5 μm. (I) Quantification of intensities of endogenous Wg normalized to HRP intensities in different genotypes. n ≥ 15 larvae; ns, no significance; **p<0.01 and ***p<0.001 by student’s t test; error bars: s.e.m. (J–L) Representative images of NMJ6/7 labeled with anti-Futsch (green) and anti-HRP (magenta) in wild type (J), egh62d18 mutants (K) and egh62d18/+; wg1/+transheterozygotes (L). Insets show higher magnification images of Futsch staining of a single bouton (asterisk). Arrows indicate boutons displaying unbundled Futsch; arrowheads denote boutons with Futsch loops. Scale bar: 10 μm. (M) Quantifications of percentage of Futsch loops and unbundled Futsch staining in different genotypes. The genotype of egh rescue was egh62d18; UAS-Egh/+; nSyb-Gal4/+; the genotype of wg was wg1/wgCX4. n ≥ 12 larvae; ns, no significance, *p<0.05; **p<0.01 by one-way ANOVA with Tukey post hoc tests, error bars: s.e.m. 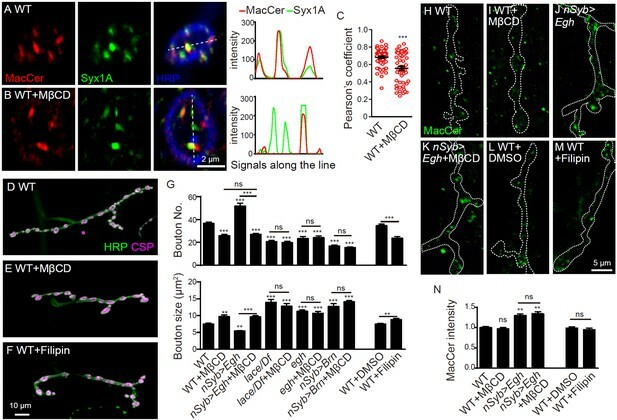 The specific colocalization of MacCer with Wg and Rab11 suggests that the trafficking or distribution of Wg at NMJ synapses may be altered upon MacCer reduction. Indeed, the staining intensity of endogenous Wg was significantly decreased in egh62d18 mutant boutons and brn-overexpressing NMJs; Conversely, Wg intensity was increased in egh-overexpressing and brn-RNAi knockdown boutons (Figure 6B, F–I and Figure 6—figure supplement 2). Thus, MacCer is both required and sufficient for Wg level at NMJ synapses. Though the total protein level of Wg in egh mutant brains appeared normal by Western assay, we found an increase of Wg in the central neuropil but not in peripheral axons within segmental nerves of egh mutants (Figure 6—figure supplement 3), suggesting a defect in axonal transport of Wg. In contrast to reduced synaptic Wg, the staining intensities of Rab11 and the Wg receptor Fz2 were largely normal in egh NMJs (Figure 6D and Figure 6—figure supplement 4). Conversely, MacCer staining was normal in wg or rab11 mutants (Figure 6—figure supplement 4). These results together show that MacCer positively regulates Wg level, but not vice versa, at NMJs. Wg coordinates pre- and postsynaptic signaling cascades that modulate synapse development. The presynaptic Wg signaling pathway promotes formation of Futsch-associated microtubule loops without transcriptional regulation (Korkut and Budnik, 2009; Miech et al., 2008). Futsch is a microtubule-associated protein, and the formation of Futsch-positive microtubule loops is essential for synaptic growth (Roos et al., 2000). In wg and arr mutants with impaired Wg signaling, the number of Futsch loops is reduced while the percentage of boutons containing unbundled Futsch is increased (Miech et al., 2008; Packard et al., 2002). We observed similar Futsch staining phenotype in brn-overexpression larvae, egh62d18 mutants and egh62d18/+; wg1/+ transheterozygotes, i.e., a significant increase in the percentage of boutons containing unbundled and punctate Futsch signals, especially in large boutons (Figure 6, J–M and Figure 6—figure supplement 2), indicating that MacCer and Wg cooperate in controlling the formation of Futsch loops. 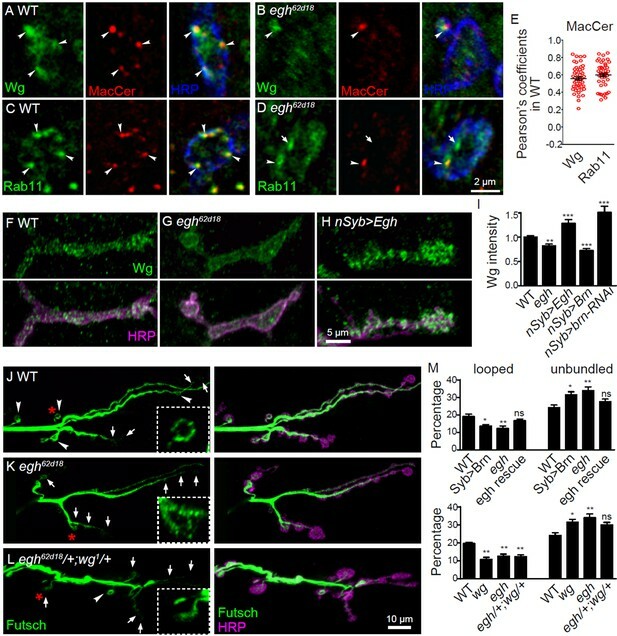 Together, these results support that MacCer facilitates presynaptic Wg signaling during NMJ development. Distinct from the presynaptic Wg pathway, Wg regulates postsynaptic differentiation and bouton formation by activating the Fz2 nuclear import pathway in postsynaptic muscles (Ataman et al., 2006; Mathew et al., 2005; Mosca and Schwarz, 2010); defects in this pathway lead to a reduced number of boutons, altered distribution of the postsynaptic type A glutamate receptor (GluRIIA), a decrease of subsynaptic reticulum (SSR) with increase of ‘ghost bouton’ that lacks of Discs large (DLG) postsynaptic staining, and enlarged pockets in SSR juxtaposed to active zones (Mosca and Schwarz, 2010; Packard et al., 2002). However, we did not find these abnormalities in egh62d18 mutants except that the GluRIIA intensity was significantly but slightly increased (Figure 7, A, B and E); rather, the ghost bouton number, the GluRIIA cluster size, as well as the SSR ultrastructure were largely normal (Figure 7, C–I), suggesting that the postsynaptic Wg signaling remains unaffected upon MacCer reduction. Postsynaptic differentiation is normal in egh mutants. (A and B) Representative images of NMJ4 from wild type and egh62d18 mutants co-stained with anti-HRP (magenta) and anti-GluRIIA (green). Scale bar: 2 μm. (C and D) Images of NMJ6/7 from wild type and egh62d18 mutants co-stained with anti-HRP (magenta) and anti-DLG (green). An arrowhead points at a ghost bouton. Scale bar: 20 μm. (E and F) Quantification of normalized intensities and area of GluRIIA against anti-HRP staining of NMJ4 (E) and ghost bouton number of NMJ6/7 (F) in wild type and egh62d18 mutants. ns, no significance, *p<0.05 by student’s t test; n ≥ 12 larvae; error bars: s.e.m. (G and H) Ultrastructure images of NMJ6/7 boutons from wild type and egh62d18 mutants. The subsynaptic reticulum (SSR; green) is folded membrane network that surrounds the presynaptic bouton (b); The SSR region juxtaposed to the active zone (AZ) is indicated by asterisks in red. Scale bar: 1 μm. (I) Quantification of various bouton parameters of NMJ 6/7 synapses in wild type and egh62d18 mutants. n = 50 boutons from five wild-type animals, and n = 37 boutons from three egh62d18 larvae. Statistical analysis was performed by student’s t test. The results shown above suggest that MacCer may interact with Wg and thus modulate its signaling activity. Previous in vitro studies show that GSLs are able to specifically bind proteins containing a structurally conserved GSL-binding motif (GBM), which contains both basic (Lys, Arg) and turn-inducing (Gly, Ser) residues (Fantini and Yahi, 2015; Hamel et al., 2010). By in silico analysis, we identified a potential GBM of Wg between amino acid residues 233 and 247, therein Lys and Met are required for the interaction with MacCer (Figure 8A). Interestingly, this region contains a palmitoylation site at Ser-239 by a palmitoleate (C16:1; Figure 8A and C) (Herr and Basler, 2012; Kakugawa et al., 2015; Takada et al., 2006), which is known to affect the association of membrane proteins to lipid rafts (Resh, 2004). Structure homology modeling and a series of molecular dynamics simulations showed that this acylated GBM is fully exposed on the protein surface and perfectly fit with MacCer. A remarkable feature of the molecular complex is that the ceramide part of MacCer interacts with the acyl chain of the GBM, whereas the sugars of MacCer bind the peptidic part of the GBM (Figure 8B and C). (A) Schematic representation of Wg protein and amino acid sequence of a putative GSL-binding motif (GBM) and mutated GBM with asterisks denoting the mutated amino acids. (B) A 3D model of Wg residues 85–277 with the location of the GBM, which exposes on the protein surface. (C) Energy-minimized model of the acylated (C16:1 ω7) GBM in Wg binding with MacCer. (D and E) Surface pressure change (Δπ) by the addition of Wg233-247 peptide (GBM peptide; D) and full-length Wg produced by in vitro translation system (E) on a monolayer of GSLs purified from wild type, egh62d18 and brn1.6P6 larvae. GBM peptide and full-length Wg showed specific high affinity to MacCer enriched GSLs. (F) Surface pressure change (Δπ) by the addition of Myc-tagged wild-type Wg (WgWT) and Wg with GBM deleted (WgGBM deleted) or mutated (WgGBM) on a monolayer of GSLs purified from brn1.6P6 larvae. All surface pressure measurements were performed in triplicate and a representative curve is shown. (G) Wild-type Wg (WgWT) but not Wg with mutated GBM (WgGBM) was pulled-down by LacCer-beads. Five biological repeats were carried out for the pull-down assay and a representative blot is shown. We then analyzed the interaction of a synthetic peptide derived from the predicted GBM of Wg with monolayers of purified GSLs by Langmuir microtensiometer experiments (Di Scala et al., 2014). The amino acid sequence of the peptide contains four Cys residues with several possibilities of forming two disulfide bridges may not fully stable under our experimental conditions. Thus we designed a synthetic peptide in which the Cys residues were replaced by isosteric Ser residues (referred to as Wg233-247). This Cys/Ser substitution respects the electrostatic distribution of partial charges at the surface of the peptide. The Wg233-247 peptide showed high affinity with LacCer (Figure 8—figure supplement 1). We further analyzed the interaction of Wg233-247 with GSLs extracted from Drosophila larvae of different genotypes. In agreement with previous findings (Hamel et al., 2010; Wandall et al., 2005), wild-type larvae expressed a broad range of GSLs including tetra- and penta-hexosylceramides, while egh62d18 mutants lacked MacCer and brn1.6P6 mutants contained almost exclusively MacCer (Figure 8—figure supplement 1). As expected, Wg233-247 showed strong interaction with MacCer-enriched GSLs from brn mutants but no interaction with MacCer-deficient GSLs from egh mutants (Figure 8D). In contrast, a GBM mutant containing mutations at key Lys and Met (K234E and M238R; Figure 8A) showed no interaction to GSLs from brn mutants (Figure 8—figure supplement 1). Moreover, we examined whether full-length Wg binds to MacCer-enriched GSLs. Myc-tagged full-length Wg was produced by an in vitro translation kit containing rabbit reticulocyte lysates and purified by anti-Myc immunoprecipitation. Wild-typed Wg showed high affinity to GSLs from brn but not egh mutants; in contrast, Wg with GBM deleted or mutated showed no affinity to GSLs from brn mutants (Figure 8E and F). We further validated the GSL binding ability of Wg by pull-down assay. Wild-type Myc-Wg but not Wg with mutated GBM was substantially pulled down by LacCer-coated beads (Figure 8G). Taken together, these data support that Wg has an intrinsic affinity for MacCer/LacCer via GBM. To further test the physiological role of the Wg GBM, we generated double site-directed point mutations of K234E and M238R in Wg (Figure 8A) by CRISPR/Cas9-mediated mutagenesis. This double point-mutation wg allele was named wgGBM. Homozygous wgGBM or in combination with a null allele wgCX4 (wgGBM/wgCX4) led to larval lethality before 3rd instar stage. However, wgGBM in combination with a hypomorphic allele wg1 (wg1/wgGBM) resulted in escapers survived to adults. The Wg protein level in wg1/wgGBM mutants was largely normal in whole larvae by western analysis and at NMJs by immunostaining compared with wg1 heterozygotes (wg1/+) (Figure 9, A–D). MacCer level was not altered in wg1/wgGBM mutants compared with that of wg1/+ heterozygous control (Figure 9, A–C). However, the colocalization between Wg and MacCer was significantly decreased in wg1/wgGBM mutants compared with that of wg1/+ heterozygous and wild-type control (Figure 9, E–H), suggesting that wgGBM mutation, presumably a null allele, affect proper localization of Wg in synaptic boutons. Wg GBM is required for Wg-MacCer colocalization and NMJ growth. (A and B) Representative images of NMJ4 co-labeled with anti-Wg (green), anti-MacCer (red) and anti-HRP (blue) in wg1/+ (A) and wgGBM/wg1 mutants (B). (C) Quantification of Wg and MacCer intensities normalized to HRP intensities in different genotypes. n ≥ 15 larvae; ns, no significance by one-way ANOVA with Tukey post hoc tests; error bars: s.e.m. (D) Western results of Wg and Actin from 3rd instar larvae of wg1/+and wgGBM/wg1 mutants. Actin was used as a loading control. Western blots were performed in triplicate and a representative image is shown. 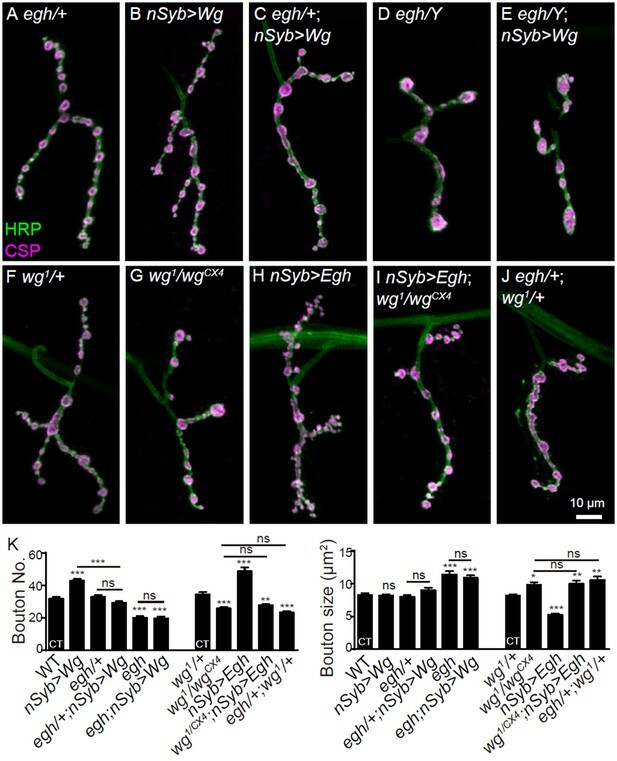 (E–G) Representative images of NMJ4 boutons triple-labeled with anti-Wg (green), anti-MacCer (red) and anti-HRP (blue) in wild type (E), wg1/+ (F) and wgGBM/wg1 mutants (G). Arrowheads indicate puncta positive for both MacCer and Wg signals; arrows indicate puncta without obvious overlap of MacCer and Wg. Images were processed by deconvolution. Scale bar: 2 μm. Plot profiles of relative intensity of MacCer and Wg along the dashed lines were shown. (H) Pearson’s coefficients of colocalization between MacCer and Wg. n = 58/10, 57/8, and 46/8 (from left to right, boutons/animals). ns, no significance, ***p<0.001 by one-way ANOVA with Tukey post hoc tests; error bars: s.e.m. (I–M) Representative images of NMJ4 co-stained with anti-HRP (green) and anti-CSP (magenta) in wgGBM/+ (I), wgGBM/wg1 (J), UAS-Wg-HA, wgGBM/wg1; nSyb-Gal4/+ (K), UAS-Egh, wgGBM/wg1; nSyb-Gal4/+ (L), and egh62d18/+; wgGBM/+ (M). Scale bar: 10 μm. (N) Quantifications of bouton number and bouton size of NMJs in different genotypes. n ≥ 12 larvae; ns, no significance, *p<0.05; **p<0.01; ***p<0.001 by one-way ANOVA with Tukey post hoc tests, error bars: s.e.m. (O–Q) Representative images of NMJ6/7 labeled with anti-Futsch (green) and anti-HRP (magenta) in wild type (O), wgGBM/wg1 (P), and egh62d18/+; wgGBM/+ transheterozygotes (Q). Insets show higher magnification images of Futsch staining of a single bouton (asterisk). Arrows indicate boutons displaying unbundled Futsch; arrowheads denote boutons with Futsch loops. Scale bar: 10 μm. (R) Quantifications of percentage of Futsch loops and unbundled Futsch staining in different genotypes. n ≥ 12 larvae; ns, no significance, **p<0.01 by one-way ANOVA with Tukey post hoc tests, error bars: s.e.m. (S) A schematic presentation of the role for MacCer in promoting synapse growth via interacting with Wg in lipid rafts. The presynaptic Wg signaling is denoted by a curved arrow. To determine if Wg GBM interacts with MacCer in regulating Wg signaling and bouton formation, we examined the genetic interaction between wgGBM and egh mutation. We found that wgGBM/wg1 mutants and egh62d18/+; wgGBM/+ transheterozygotes showed fewer and larger boutons, and the phenotype in wgGBM/wg1 mutants was rescued by neuronal expression of Wg but not by expression of Egh (Figure 9I–N). The NMJ phenotype of wgGBM/wg1 was insensitive to egh overexpression (Figure 9L and N), supporting that wg is epistatic to egh. We also observed significantly fewer boutons with Futsch loops and more boutons with unbundled Futsch staining in both wgGBM/wg1 mutants and egh62d18/+; wgGBM/+ transheterozygotes (Figure 9O-R). Together, these findings suggest that the intact Wg GBM is critical for proper Wg localization, Wg signaling and thus bouton formation. 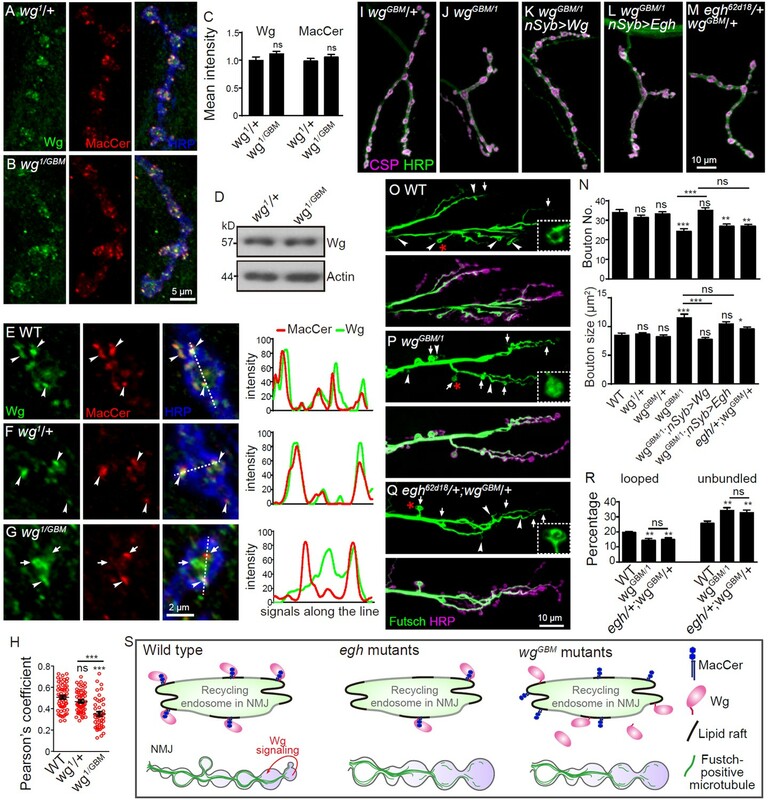 In the present study, based on genetic analysis of cell-type specific manipulations of Egh, Brn and Wg expression, together with immunochemical, genetic interaction and lipid-protein interaction analysis, we demonstrate that MacCer promotes NMJ bouton formation by interacting with Wg, thereby facilitating presynaptic Wg signaling. 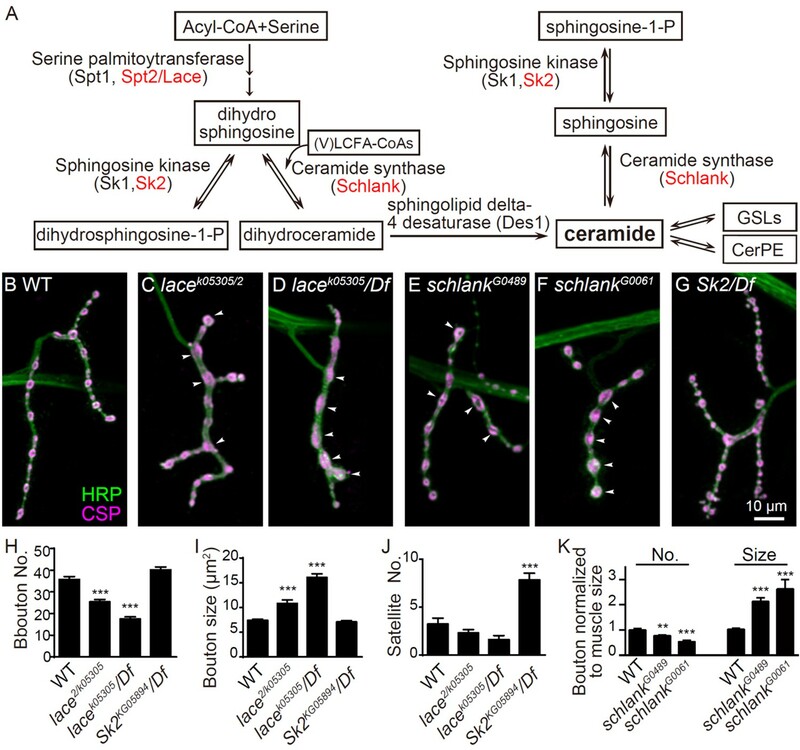 This is the first report defining a critical role of a specific class of sphingolipids in synapse development. Sphingolipids are essential components of lipid rafts which regulate multiple signaling pathways and neural functions. The present study provides compelling evidence implicating sphingolipids in regulating NMJ growth (Figure 1 and Figure 2; Supplementary file 1). Previous studies revealed that various mutations in either egh or brn result in similar ovarian defects and neuronal hypertrophy during embryogenesis (Goode et al., 1996). The similarity of egh and brn mutant phenotypes suggests that both are caused by a lack of complex GSLs downstream of brn. A more recent study showed that egh mutations result in overgrowth of subperineurial glia through elevated phosphatidylinositol-3 kinase (PI3K) signaling; the glial phenotype is due to the accumulation of GlcCer, the substrate of Egh (Dahlgaard et al., 2012). At NMJs, however, our data demonstrate that the NMJ defects in egh mutants are caused by lack of MacCer. Do other classes of sphingolipids besides MacCer also regulate synapse development? Many sphingolipids, such as phosphorylated sphingosines and CerPE, the most abundant sphingolipid in lipid rafts, play a diverse array of functions in the nervous system (Fantini and Yahi, 2015; Yonamine et al., 2011). It will be intriguing to define the molecular mechanisms by which these structural and signaling sphingolipids regulate synapse development. Drosophila NMJ development is mediated by multiple signaling cascades. How does MacCer function in synaptic growth? Consistent with previous findings that GSL/lipid rafts are enriched in recycling endosomes (Balasubramanian et al., 2007; Gagescu et al., 2000; Hortsch et al., 2010), we observed a substantial colocalization between MacCer and recycling endosomal marker Rab11 at NMJ synapses (Figure 6). We note, however, the impact of MacCer and Rab11 on NMJ growth is opposite. The NMJ bouton formation is positively regulated by MacCer but negatively regulated by Rab11 (Huang et al., 2016; Khodosh et al., 2006; Liu et al., 2014; this study). The opposite effect on NMJ growth of the two might be caused by the fact that MacCer and Rab11 regulate different signaling pathways. For example, Rab11 inhibits BMP signaling (Huang et al., 2016; Liu et al., 2014) while MacCer facilitates Wg signaling (this study) at NMJ terminals. Our results showed that MacCer facilitates the presynaptic Wg signaling in promoting NMJ growth (Figure 5). 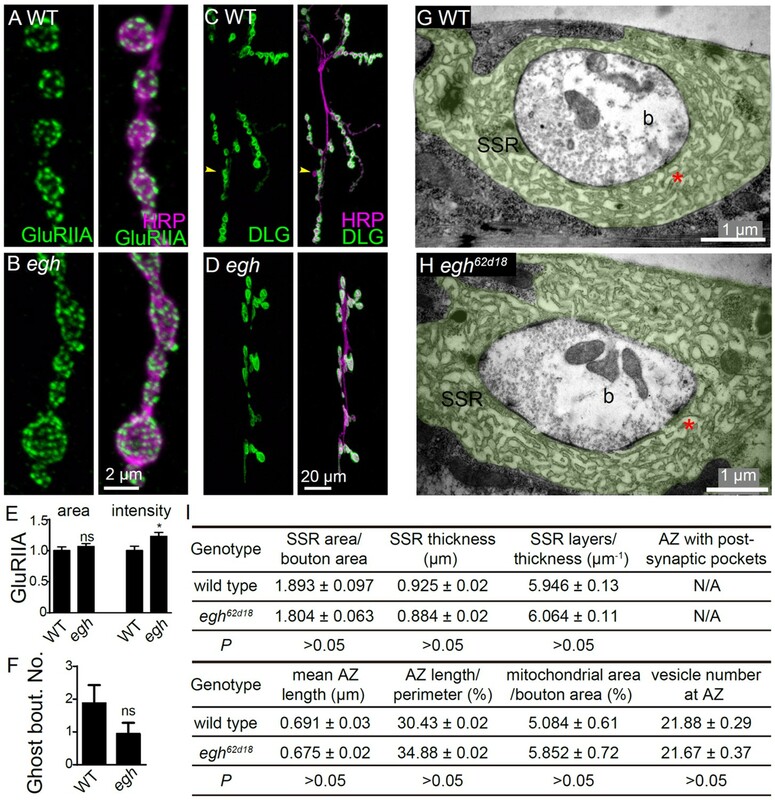 In contrast to the abnormal microtubule cytoskeleton (Figure 6), egh mutants showed normal postsynaptic differentiation with no increase in ghost bouton number as well as normal SSR ultrastructure (Figure 7), suggesting a specific regulation of presynaptic rather than postsynaptic Wg activity by MacCer. 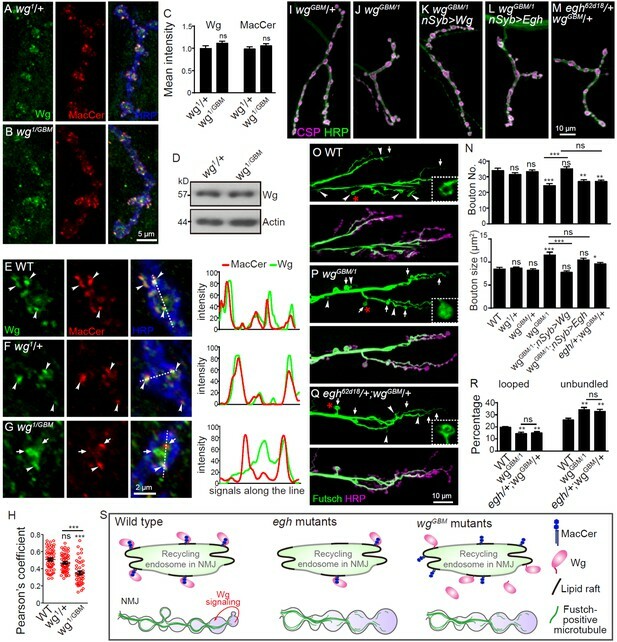 A recent study showed that at NMJs, Wg is secreted from glial cells as well as presynaptic motor neurons, and that this glia-derived Wg controls the assembly of postsynaptic machinery at NMJs without affecting the bouton number (Kerr et al., 2014). The normal postsynaptic differentiation in egh mutants may be due to normal postsynaptic Wg signaling triggered by glia-derived Wg. This postulation is supported by the observation that manipulations of glial MacCer by genetic means did not affect NMJ growth (Figure 2—figure supplement 2). How does MacCer affect Wg signaling at the molecular and cellular levels? Wg associates with lipid rafts via its acylation (Zhai et al., 2004), enabling its access to the raft-component MacCer. Upon lipid raft disruption by sterol depletion, Wg de-localizes from the lipid rafts (detergent-resistant, cholesterol-rich membrane microdomains) revealed by biochemical fractionation (Zhai et al., 2004). We envisage that delocalization of Wg does not allow its binding to MacCer, compromises its transport to the NMJ terminals (Figure 5—figure supplement 1), and in turn restricts NMJ growth (Figure 4). This notion is supported by colocalization of MacCer and Wg on specific membrane domains of presynaptic organelles (Figure 6) and direct MacCer-Wg binding (Figure 8). 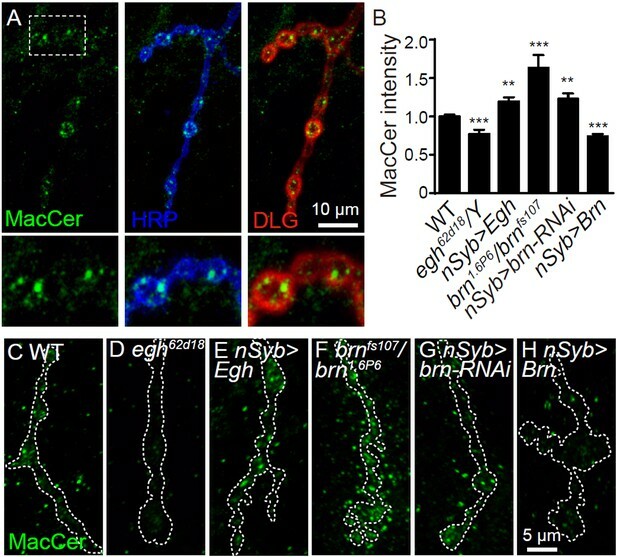 As MacCer is both required and sufficient for normal Wg expression at NMJ boutons, but not vice versa (Figures 6 and 9), we propose that MacCer acts as an adaptor for Wg at the presynaptic recycling endosomes (Figure 9). 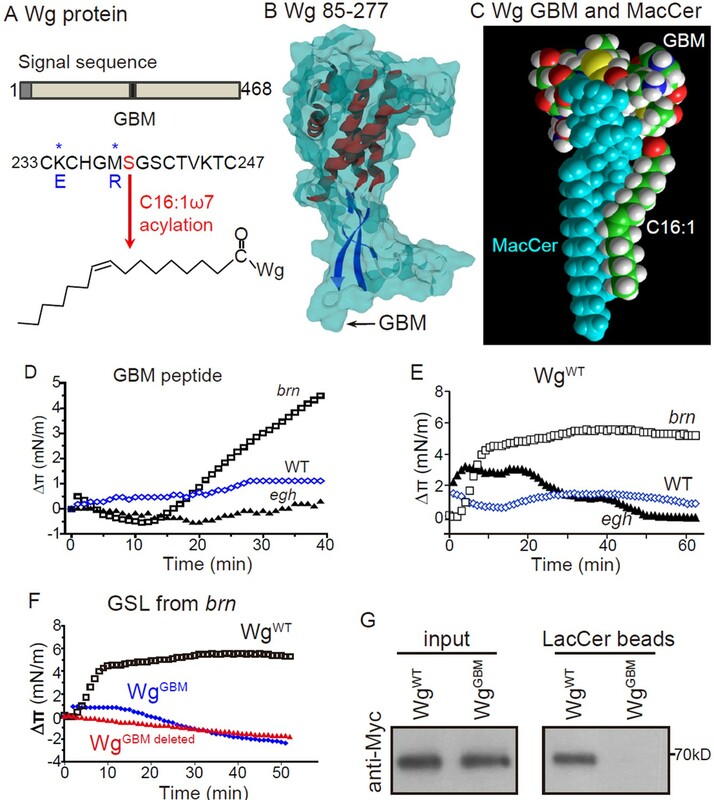 Our in silico data combined with biochemical and genetic analysis of GSL-Wg interaction further showed that the 233 – 247 domain of Wg, which is acylated at Ser-239, is a functional GBM that mediates high affinity binding to MacCer. Although we could not exclude the possibility that Wg GBM might have other function independent of MacCer binding, our in vivo data support that the GBM plays important roles in Wg-MacCer colocalization, Wg signaling and NMJ development (Figure 9). The association of Wg with membrane rafts requires the acylation at Ser-239 mediated by Porcupine, a process conserved from Drosophila to vertebrates (Galli et al., 2007; Herr and Basler, 2012; Zhai et al., 2004). Importantly, the acylation by Porcupine is essential for the recognition of Wg by Evi thereby affecting the transport and secretion of Wg through recycling endosomes and exosomes (Herr and Basler, 2012; Koles et al., 2012; Korkut et al., 2009). Furthermore, both Porcupine and Evi are known to regulate the synaptic level of Wg and the signaling activity (Korkut et al., 2009; Packard et al., 2002). In the present study, we showed a reduction in Wg level at NMJ terminals but an increase in the neuropil of the ventral nerve cord of egh mutants (Figure 6 and Figure 6—figure supplement 2), similar to that in evi mutants with impaired Wg transport and secretion (Korkut et al., 2009). These findings suggest that the transport and trafficking of Wg via endosomes may be compromised when MacCer is deficient. The detailed mechanism by which MacCer regulates Wg transport and trafficking remains to be further investigated. As Wnt signaling, which is widely involved in various developmental processes and diseases including neurological and psychological diseases, is evolutionally conserved (Herr et al., 2012; Korkut and Budnik, 2009; Salinas, 2012), our finding that MacCer facilitates Wg signaling transduction suggests a new target for intervening Wnt signaling associated pathogenesis. Flies were cultured on standard cornmeal media at 25°C. w1118 was used as the wild type control, unless otherwise indicated. egh62d18, brn1.6P6, UAS-Egh-Myc (Wandall et al., 2005) and UAS-Brn (Chen et al., 2007) were provided by S. M. Cohen and S. Pizette. evi2 was from V. Budnik (Korkut et al., 2009). UAS-ManII-GFP was from Y. N. Jan (Ye et al., 2007). UAS-Spin-GFP was from G. Davis (Sweeney and Davis, 2002). The following fly lines were obtained from the Bloomington Stock Center: Df(2L)Exel7063, Df(3L)BSC671, Sk2KG05894, lace2, lacek05305, schlankG0489, schlankG0061, egh7, brnfs107, arr2, arrk08131, wgCX4 (wg[l-17]), wg1, rab1193Bi, nSyb-Gal4, OK6-Gal4, C57-Gal4, Repo-Gal4, UAS-Wg-HA, UAS-brn-RNAi, UAS-YFP-Rab5 and act-Cas9. For fly strains used in the genetic screen, UAS-GalNAc-TA and UAS-GalNAc-TB were provided by S. M. Cohen (Chen et al., 2007). desat110A, desat111A, desat1119A and desat1EY07679 were provided by E. Hafen (Köhler et al., 2009). Other fly lines were obtained from the Bloomington Stock Center, Kyoto Stock Center and the Tsinghua Drosophila RNAi Center. We generated double site-directed point mutations at K234E and M238R in Wg to test the function of GBM. The CRISPR/Cas9-mediated targeted mutagenesis of wg (CG4889) from w1118 was performed largely according to previously published homology-directed repair procedures (Gratz et al., 2014; Port et al., 2014) at Fungene Biotech (http://www.fgbiotech.com). sgRNA (synthetic guide RNA) targets were designed with CRISPR Optimal Target Finder (Gratz et al., 2014). Two sgRNAs recognized the region containing the mutations (gcgacaggagtgcaaatgccatgg and gcaaatgccatggcatgtccgg; the last three bases ngg denotes proto-spacer adjacent motif) were cloned into U6b-sgRNA vector (Ren et al., 2013). For donor vector construction, a 1.8 kb wg gene region containing the site-directed mutation was cloned into pBluescript SK (-) vector. The donor vector with the site-directed mutation and the sgRNA vector were injected into act-Cas9 transgenic embryos. PCR sequencing was performed to identify if the offspring flies carried the designed mutation. Immunostaining of larval preparations was performed as previously described (Liu et al., 2014). For most antibody staining, specimens were dissected in Ca2+-free HL3 saline, fixed in 4% paraformaldehyde for 30 min, and washed in 0.2% Triton X-100 in PBS. For MacCer staining, specimens were fixed in 4% paraformaldehyde at 4°C for 60 min and permeabilized with 0.1% Triton X-100 in cold PBS, incubated with undiluted anti-MacCer hybridoma supernatants for 18 hr at 4°C and detected with Fluor 568 conjugated goat anti-mouse IgM (1:1000; Invitrogen). For GluRIIA staining, specimens were fixed in cold methanol for 5 min. We used the following antibodies: mouse anti-cysteine string protein (CSP) (1:300; 6D6 from DSHB), mouse anti-Wg (1:10; 4D4 from DSHB), mouse anti-Futsch (1:50; 22C10 from DSHB), mouse anti-Rab11 (1:50; BD Biosciences), mouse anti-DLG (1:500; 4F3 from DSHB), mouse anti-GluRIIA (1:200; 8B4D2 from DSHB), mouse anti-Fas II (1:50; 1D4 from DSHB), mouse anti-Syx1A (1:20; 8C3 from DSHB), mouse anti-dFz2 (1:5; 12A7 from DSHB), mouse anti-HA (1:1000; MBL International), mouse anti-Myc (1:300; CWBIO, MBL International), rat anti-GFP (1:200; MBL International), and fluorescence-conjugated anti-horseradish peroxidase (HRP) (1:200; Jackson ImmunoResearch). Primary antibodies were visualized using corresponding secondary antibodies conjugated to Fluor 488, Cy3 (both at 1:1000; Invitrogen) or DyLight 649 (1:500; Jackson ImmunoResearch). Western analysis was performed as previously described (Liu et al., 2014). Briefly, 3rd instar larval brains were dissected in cold PBS and homogenized in RIPA buffer (50 mM Tris-HCl at pH 7.4, 150 mM NaCl, 0.1% SDS, 1% NP-40) with proteinase inhibitors Set I (Calbiochemistry) on ice. Samples were then subjected to SDS-PAGE and immunoblotting according to standard procedures. The following antibodies were used: mouse anti-Wg (1:50; 4D4 from DSHB), mouse anti-Syx1A (1:1000; 8C3 from DSHB), and mouse anti-actin (1:50000; Millipore Bioscience Research Reagents). All Western blotting were performed at least for three independent biological replicates. Image collecting was carried out as previously described (Liu et al., 2014). NMJ images were collected with an Olympus Fluoview FV1000 confocal microscope using a 40x/1.42 NA or 60 x/1.42 NA oil objective and FV10-ASW software, or with a Leica confocal microscope using a 40x/1.25 NA oil objective and LAS AF software. All images of muscle 4 or muscle 6/7 glutamatergic type Ib NMJ of abdominal segments A2 to A4 for a specific experiment were captured using identical settings for statistical comparison among different genotypes. High resolution confocal images were processed with the deconvolution software AutoQuant X2 (Media Cybernetics). Brightness, contrast, and color were adjusted using Photoshop CS5 (Adobe). NMJ morphological features were quantified using ImageJ (National Institutes of Health, Bethesda, MD). For quantification analysis of NMJ growth, individual boutons were defined according to the discrete staining signal of anti-CSP. Satellite boutons were defined as extensions of five or fewer small boutons emanating from the main branch of the NMJ terminals. For quantification of bouton sizes, synaptic areas (μm2) were measured by assessing HRP-positive boutons, and normalized to bouton numbers. Ghost boutons were defined as boutons positive for HRP staining but negative for DLG staining. NMJ bouton number and size of schlank mutants were normalized to muscle surface area. For quantification of protein levels at NMJ, staining intensities of each protein were measured within HRP-positive NMJs using ImageJ. For colocalization analysis, single slices were analyzed using WCIF-ImageJ ‘Colocalization Analysis’ within HRP-labeled synaptic boutons. Statistical comparisons were performed using GraphPad Prism 6. Data of NMJ features are expressed as mean ± standard error of the mean (s.e.m.). Statistical significance between each genotype and the controls was determined by two tailed Student’s t test, whereas multiple comparisons between genotypes were determined by one-way ANOVA with a Tukey post hoc test. Asterisks above a column indicate comparisons of a specific genotype to wild type (denoted WT) or genetic control (denoted CT), whereas asterisks above a bracket denote comparisons between two specific genotypes. ns denotes p>0.05; * indicates p<0.05; ** denotes p<0.01; *** indicates p<0.001. Larvae of different genotypes were raised on vehicle- or drug-containing media from egg hatching. D,L-threo-PDMP (Matreya) and filipin III (Cayman) were dissolved in DMSO and then individually added to standard media at specific concentrations. All the treatments used DMSO vehicle at a concentration of 0.5%. MβCD (Sigma-Aldrich) was resolved in standard media at a final concentration of 20 mM. Docking of Wg onto MacCer was performed with the Hyperchem 8.0 program as described previously (Fantini and Yahi, 2011). Homology modeling of Wg fragment of 85 – 277 amino acids was based on the published crystal structure of XWnt8 (Janda et al., 2012). Synthetic peptides of GBM (95%) were purchased from Sangon Biotech. Myc-tagged full-length Wg were produced by an in vitro translation kit containing rabbit reticulocyte lysates (Promega). pCDNA-Myc-Wg was expressed in the translation system at 30°C for 90 min. Myc-Wg was immunoprecipitated with anti-Myc affinity resin (Millipore), eluted with a Myc-peptide solution (Sigma), and concentrated using a 30kD filter column (Amicon). GSL–protein interactions were determined with the Langmuir-film balance technique as previously described (Di Scala et al., 2014). It was monitored by surface pressure with a fully automated microtensiometer (μTrough SX; Kibron Inc.). All experiments were performed at 20 ± 1°C. Monomolecular films of GSLs were spread on pure water subphases (800 μl) from chloroform/methanol (1:1 vol/vol). The initial surface pressure of the monolayers was 12–15 mN/m. The accuracy of our experimental conditions was ±0.25 mN/m. Real-time measurements kinetically followed the increase in the surface pressure after injecting the peptide or protein (final concentration of 10 μM) into the aqueous phase underneath the GSL monolayer until equilibrium was reached. The data were analyzed with the FilmWareX program (version 3.57; Kibron Inc.). Lipid–protein pull-down assay was modified following a previous protocol (Kunisaki et al., 2006). Wild-type and mutated Myc-Wg were produced by an in vitro translation kit containing rabbit reticulocyte lysates (Promega). The reticulocyte lysates were suspended in 400 μL lipid-binding/washing buffer (10 mM HEPES, pH 7.4, 150 mM NaCl, 0.35% NP-40) and incubated with 20 μL slurry of control or LacCer-coated beads (Echelon) at 4°C for 3 hr under rotary agitation. After extensive washing with lipid-binding/washing buffer, the bound proteins were eluted from beads with 2 × Laemmli sample buffer and subjected to Western analysis with mouse anti-Myc (1:1000; CWBIO). GSL extraction was performed as described (Hamel et al., 2010; Wandall et al., 2005). 3rd instar larvae were homogenized in 1.5 ml solvent A (2-isopropanol/hexane/water; 55:25:20 vol/vol/vol). The homogenate was centrifuged at 2,000 rpm and the supernatant was collected. This step was repeated with 1.5 ml solvent B (chloroform/methanol; 1:1 vol/vol), 1.5 ml solvent A, and finally 1.5 ml solvent B. The four solvent extracts were combined, evaporated under a nitrogen flux, and re-suspended in chloroform/methanol (2:1 vol/vol) at a lipid concentration of 1 mg/ml. The extracts were again evaporated, then re-suspended in 5 ml methanol containing 0.1 M NaOH, and incubated for 1 hr at 37°C under agitation to remove most glycerolipids. The samples were evaporated and re-extracted in chloroform/methanol (2:1 vol/vol). Neutral GSLs were finally purified on a column (DEAE-Sephadex A-25; Sigma-Aldrich) and eluted with chloroform/methanol/water (30:60:8 vol/vol/vol). GSL extracts were analyzed by high performance thin layer chromatography (HPTLC) using silica gel 60 HPTLC plates (Merck) in chloroform/methanol/water (60:35:8 vol/vol/vol). The HPTLC plates were sprayed with orcinol and heated at 110°C for GSL detection. GSLs bands were identified by their mobility relative to GSL standards (Matreya). Electron microscopy (EM) was performed as described (Liu et al., 2014). Briefly, dissected 3rd instar larvae were fixed overnight at 4°C in 2% glutaraldehyde plus 2% paraformaldehyde in 0.1 M cacodylate buffer (pH 7.4), and post-fixed in 1% OsO4 in cacodylate buffer for 90 min at room temperature. Samples were stained in saturated aqueous uranyl acetate for 1 hr, dehydrated in a graded acetone series and embedded in Spurr resin (Electron Microscopy Sciences). Type 1b boutons from NMJ 6/7 in abdominal segments A2 to A4 were serially sectioned with a Leica UC6 ultramicrotome, stained with uranyl acetate and Sato’s lead, and observed using a JEOL 1400 electron microscope. The number of synaptic vesicles within a 200 nm radius of the active zones (AZs) in egh mutants and wild type was quantified. Other features were quantified as previously described (Packard et al., 2002). Molecular and Cellular Biology 19:7276–7286. Biochimica et Biophysica Acta (BBA) - Molecular and Cell Biology of Lipids 1851:1006–1016. Biochimica et Biophysica Acta (BBA) - Biomembranes 1758:1957–1977. Journal of Molecular Biology 408:654–669. 87–103, Chapter 4 - Variations of Brain Lipid Content, Brain Lipids in Synaptic Function and Neurological Disease, San Francisco, Elsevier Academic Press. Journal of Lipid Research 45:54–62. Molecular Biology of the Cell 11:2775–2791. The Journal of Cell Biology 188:581–594. The Journal of Neuroscience 23:3262–3271. Trends in Molecular Medicine 18:483–493. Molecular Biology of the Cell 21:778–790. Journal of cell science 129:4034–4045. Journal of Biological Chemistry 287:16820–16834. The Journal of Cell Biology 174:647–652. Journal of Biological Chemistry 274:12049–12054. Cold Spring Harbor Perspectives in Biology 4:a008003. Journal of Biological Chemistry 277:32421–32429. Journal of Biological Chemistry 288:11520–11530. Journal of Biological Chemistry 278:1411–1414. Journal of Biological Chemistry 280:4858–4863. The Journal of Cell Biology 187:343–353. The Journal of Cell Biology 192:557–567. Journal of Lipid Research 50:S440–S45. Journal of Biological Chemistry 279:33220–33227. Annual Review of Genetics 48:119–148. Thank you for submitting your work entitled "The glycosphingolipid MacCer promotes synaptic bouton formation in Drosophila by interacting with Wnt" for consideration by eLife. Your article has been reviewed by three peer reviewers, one of whom is a member of our Board of Reviewing Editors, and the evaluation has been overseen by a Reviewing Editor and a Senior Editor. The following individuals involved in the review of your submission have agreed to reveal their identity: Thomas Lloyd (Reviewer #3). The reviewers have discussed the reviews with one another and the Reviewing Editor has drafted this decision. We are concerned that the revisions required will take significantly more than two months. We are therefore turning down the manuscript. We, however, encourage re-submission when you feel you are able to address these substantive concerns. Huang et al. show that glycosphigolipid (GSL) MacCer regulates Drosophila neuromuscular junction development by genetically manipulating enzymes in MacCer production. These results are internally consistent, and they show that reduction of MacCer correlates with fewer and larger synaptic boutons, a phenotype that is reminiscent of Wg mutants. The authors go on to show that the Wg and GSL pathways genetically interact and they provide some evidence that MacCer binds Wg via lipid rafts, although we found these results at the moment less compelling. As you will see, the reviewers have made a list of constructive comments that we believe you will be able to address; most issues are of technical in nature. There is, however, one point that surfaced during the discussion that the reviewers felt was not yet sufficiently supported. This is the issue of showing conclusively that Wg binds to MacCer in vivo. The reviewers would like to see a second methodology where you show this. Given this is a central point in your paper we would encourage you to pursue experiments to address this. The manuscript "The glycosphingolipid MacCer promotes synaptic bouton formation in Drosophila by interacting with Wnt" by Huang et al., describes that MacCer interacts with Wg via a GSL-binding motif in Wg. The idea that Wg binds directly to MacCer in vivo is intriguing, but the presented data are not strong enough to make this point. Moreover, one of their main findings is also that MacCer is enriched in recycling endosomes, but there are no experiments made to uncover the biological significance of this finding. A larger concern of mine is that the idea that sphinolipids regulate synaptic growth is not new and was described by the authors in a previous manuscript: "Acsl, the Drosophila ortholog of intellectual-disability-related ACSL4, inhibits synaptic growth by altered lipids" Huang et al., 2016. In that paper they showed that synaptic bouton formation is dependent on fatty acid membrane composition via Acsl function. Moreover, they showed that MacCer level were increased in Acsl mutant synapses. The authors are not properly placing the present paper in the context of their previous work are there is significant overlap with the current manuscript (e.g. in Figure 2 and Figure 3). In summary, I think the current work shows potential new insights into lipid regulation at the synapse, but it clearly requires substantial additional experimental data to cover the consequence of MacCer function in recycling endosomes and in vivo data of MacCer binding to Wg and data showing what happens in wg GBM mutant animals especially in respect to MacCer. - In the Materials and methods section, the authors stated that they used synapses form muscle 4 or 6/7 and abdominal segments A2 to A4. Synapses morphology vary significantly between these two muscle types and segments. It is important to separate out these data and show them per muscle and per segment. - Figure 1: The authors used RNAi lines from the Vienna collection to screen for defects in NMJ morphology. There is no confirmation of knock down efficiency, target specify or off target effects. Two independent RNAi lines haven been used for each gene (schlank and lace), but the quantification of the phenotypes does not include both lines. - Figure 2: The authors claim that egh function on NMJ growth is synapse specific. However, there are is no consistent quantification that could support this point regarding satellite boutons, bouton size and bouton nr. - Figure 4: The authors did not show the effect of Filipin on MacCer levels. - Figure 6 and Figure 6 supplements: The authors state that MacCer colocalize with Wg and Rab11 at the synapse, but they did not perform a Pearson Coefficient analysis to support these statements. The authors did not provide a co-localization analysis of MacCer with late endosomes, early endosomes and Golgi markers. Moreover, the authors should provide further evidence by using other more commonly used organelle markers. There is also no quantification of Western blot data to state that Wg levels in egh mutant brains are normal. Additional data on axonal transport would be more suitable to support the notion about Wg secretion into the synapse. Especially since it is known that egh and brn mutants show enlarged nerves (Dahlgaard et al., 2012). There are no representative images for MacCer and Fz2 fluorescent intensities in egh mutants and wild types in Figure 6—figure supplement 2C. Again, not all quantified genotypes show representative images in main Figure panel L.
- Figure 8: In silico predictions and physiochemical experiments suggest a direct binding of Wg to MacCer, but there is no evidence that this is also true in vivo. The authors made the wg GBM mutant and claim that this would affect lipid rafts via disrupted MacCer binding. However, the presented data are not very direct and the implication of MacCer levels and localization in wg GBM mutant animals is lacking. The authors screen a number of different genetic lipid synthesis mutants and identify abnormal NMJ development in animals where mutations inhibit sphingolipid metabolism. They then identify that enzymes that act sequentially on MacCer production have opposing effects on NMJ development; loss of Egh (that produces MacCer) produces fewer and larger boutons, while loss of Brn (that metabolizes MacCer to GlcNac-MacCer) produces more boutons including satellite boutons. They also conclude (largely based on sterol depletion) that presynaptic MacCer is biologically active within lipid rafts. The final section of the paper addresses the mechanism by which MacCer promotes synaptic growth (putatively from presynaptic lipid rafts). They describe that Wg and Egh genetically interact at the level of NMJ bouton number and size. They show abnormal Wg-signalling markers in Egh boutons, including that Wg and Rab11 colocalize with anti-MacCer labelling, Wg levels vary with Egh genotype, and use the presence/ absence of Wg-sensitive Futsch-loops to further test if MacCer facilitates Wg signalling. Finally, molecular modelling and in vitro analysis is used to support a model where Wg directly binds to MacCer. Overall, while the topic is interesting, several data sets are over-interpreted, and controls are missing. The paper tries to make many points, but the data is lacking for some parts of their model. This is particularly true for the claims on SL synthesis (like Figure 1), as well as the concept that MacCer is active in lipid rafts and/ or endosomes. On the other hand, there is considerable data on the point that Egh (MacCer) genetically interacts with Wg and affects presynaptic Wg signalling – though again the manuscript falls short of convincingly proving a direct physical interaction (Figure 8). One issue is that the first half of the paper (Figures 1-5) is limited to bouton numbers and bouton sizes. However, many molecular pathways converge to affect these variables and it is not possible to confidently assign genes (or drug treatments) to a single common molecular pathway. The authors should add additional readouts of synaptic development to see if their conclusions on genetic interactions stand up. There may be parts of this in the final figures showing Wg-related defects in Egh lines, but these analyses were not conducted for the majority of genetic interactions shown in Figures 1-5. Related is that there are several experiments that use constitutive hypomorphs/ knock-out lines of widely expressed genes but interpret data to conclude that genes act presynaptically. For example, Figure 1 shows synaptic defects in constitutive mutants of Schlank, lace and Sk2, without genetically rescuing to show that they operate presynaptically. The Figure 5 genetic interaction between Wg and Egh uses many constitutive mutants. The authors need to better establish that all phenotypes are cell autonomous to motor neurons (RNAi and re-expression in mutant backgrounds with motor neuron-specific drivers). This problem is amplified with the pharmacological treatments. Drugs that deplete sterols or GSL from egg hatching likely broadly impair development rather than specifically affect lipids in synapses as the authors interpret. At the very least control data is needed on larval size, time to pupate, and general tissue development, etc. The conclusion that sterol and SL depletion data show MacCer operating in lipid rafts is overinterpreted given the drug treatments will affect all cells in the animal from egg hatching and have multiple impacts at the level of neuronal function (not just disrupting presynaptic lipid rafts). The final parts of the paper contain the more convincing data on a genetic interaction between Egh and Wg, including multiple signs of abnormal Wg singling in Egh mutants. However, it seems particularly critical to be sure of direct binding between Wg and MacCer and ideally the authors can show this via a second methodology since the manuscript has too little experimental data to prove this. The concept that MacSer is specifically important and localised to endosomes also isn't fully established. If important, the authors should biochemically test this, for example via lipid MS of purified endosomes. Huang and colleagues demonstrate a novel role for the glycosphigolipid (GSL) MacCer in regulating Drosophila neuromuscular junction development. By genetically modulating enzymes up- and downstream of MacCer production, the authors nicely show that reduction of MacCer correlates with fewer and larger synaptic boutons. This NMJ phenotype is reminiscent of Wg mutants, and indeed, Wg and GSL pathway mutants genetically interact, and overexpression of Wg presynaptically rescues the MacCer deficient phenotype. The authors provide evidence that MacCer directly binds Wg via lipid rafts, and this underlies the role of this GSL in NMJ bouton development. The data provided are of high quality, and the conclusions are compelling. The generation of the GBM Wingless mutant via CRISPR is an excellent new tool for the investigators to further explore the role of Wg-GSL interactions in Wg function. While I acknowledge that extensive characterization of this new allele is beyond the scope of this study, a few more experiments are necessary to test their hypothesis. First, the authors should examine bouton size in Wg[GBM/1] animals as they have done in previous figures to determine if this phenocopies mutants that cause reduction of MacCer. Second, the authors should show that these phenotypes can be rescued by presynaptic expression of wildtype Wg. Finally, it would be of great interest to determine if the Wg[GBM/1] phenotype is modulated by egh and brn genetic manipulations as was performed in prior figures. If the Wg[GBM/1] phenotype is epistatic to brn and egh as would be predicted by the model, an insensitivity of this GBM allele to MacCer levels would be strong genetic evidence that these GSLs are regulating synaptic development through Wg. The alteration in MacCer levels in egh mutants are quite modest (Figure 3B). Is this because of the partial LOF nature of the alleles or due to alternative ways of generating MacCer? In this regard, the data provided (Figure 8—figure supplement 1C) don't convince me of their conclusion that "egh62d18 mutants contained chiefly GlcCer ". In Figure2L, the authors show that brn[fs107/Y] mutants have a significant increase in bouton no. Presumably, this is compared with WT male larvae, though the control should be explicitly stated. What is the WT strain used, and is it the appropriate genetic background control? In Figure 2, which egh allele is used in the rescue experiments? Thank you for submitting your article "The Glycosphingolipid MacCer promotes synaptic bouton formation in Drosophila by interacting with Wnt" for consideration by eLife. Your article has been reviewed by K VijayRaghavan as the Senior Editor, a Reviewing Editor, and two reviewers.. The following individual involved in review of your submission has agreed to reveal his identity: Thomas Lloyd (Reviewer #2). Overall, the manuscript is much better and is nearly ready for acceptance. The data is now more convincing that presynaptic MacCer interacts with Wg and, in doing so, affects presynaptic Wg signaling and synaptic development. Figure 1 and Figure 2 now convincingly show that Egh and Brn act in motor neurons to oppositely affect synapse development. These data overlap partially with that in their 2016 Huang et al., publication. However, the extra genetics, in particular, that they analyze motor neuron-specific Egh and Brn expression and RNAi, do now establish the basal importance of MacCer that wasn't so clear before. The data also establish that Wg protein interacts directly with the MacCer lipid to complement the genetic interaction data. The following essential revisions can be made by addressing them in the abstract, results and discussions. Many aspects, such as antibody specificity, are buried in the text for the reader to decipher as then go through. These and such concerns as given below should be addressed by re-writing in a more focused manner. The data fails to convince on the lipid raft localized nature of this interaction, or precisely what this means. One issue is that we would expect that plasma membrane "lipid raft" domains also exist at these synapses, but yet the authors only detect internal signal with the MacCer antibody. The pharmacological approaches that disrupt sterols are broad and likely do much more than just affect lipid rafts. It feels like an over-interpretation to designate these to the same genetic pathway on the basis that the double manipulation is similar to sterol or MacCer loss alone; perhaps the phenotype is already as severe as it can be. Further, they interpret Figure 4 data to mean that lipid rafts have some impact on MacCer function, without further elucidating on what this might be. The most obvious functional impact is that lipid rafts concentrate MacCer to specific membrane domains, in turn facilitating binding to Wg protein. However, if so, why does MacCer staining remain punctate even after lipid rafts are disrupted by sterol depletion? If their model is correct, we would expect they see diffuse/ less intense/ less punctate MacCer labeling? A more detailed discussion of this should be added if it is indeed important or, ideally, they consider an in vitro system where lipid rafts +/- MacCer are easily detectable (for example on the surface of some mammalian cell lines). The MacCer antibody is the only readout of MacCer levels (there is no direct analysis of lipid levels in the mutants). It would, therefore, be good if they provide data on antibody specificity. This could include ruling out the possibility that it detects a different molecule that also rises and falls with altered synaptic size; for example, whether MacCer staining remains normal with other manipulations that affect synapse structure (like in Wg mutants). Some of this may be already in the manuscript, but it would help if the issue is directly addressed given non-specific labeling would invalidate many of their conclusions. I also wonder about antibody accessibility when proteins interact with MacCer. Presumably, Wg and the antibody interact with the carbohydrate group of MacCer, so the MacCer antibody would detect less MacCer if it is already complexed with Wg (or other binding partners)? This seems like something to consider when interpreting colocalization data and when using the antibody to determine synaptic MacCer levels. To further support the binding of Wg and MacCer, we have added two independent lines of evidence. First, wild-type but not GBM mutation-carrying Wg binds LacCer (the vertebrate analog of MacCer) (Figure 8). Second, wgGBM mutation led to a decrease of co-localization between MacCer and Wg in NMJs (Figure 9; also see the response to the third point of this reviewer). The biological function of MacCer in recycling endosomes is to facilitate membrane trafficking of Wg. MacCer enrichment in recycling endosomes is consistent with previous findings that lipid rafts/LacCer are enriched in recycling endosomes (Balasubramanian et al., 2007; Hortsch et al., 2010; Sabharanjak et al., 2002). The intracellular trafficking of lipid rafts from Golgi or early endosomes to plasma membrane via recycling endosomes is thought to impact trafficking of many raft-associated proteins (reviewed in Simons and Toomre, 2000). We have added these references on lipid rafts trafficking via recycling endosomes in in subsection “MacCer promotes NMJ bouton formation via Wg signaling” and subsection “MacCer promotes synaptic growth via presynaptic Wg signaling” in the revision (also see the response to the third point of this reviewer). We have previously reported that reducing MacCer level by egh62d18 mutation or brn-overexpression in neurons lead to fewer and larger boutons as well as restrict the NMJ overgrowth in Acsl mutants (Huang et al., 2016). However, in that study, we did not dissect the mechanism by which MacCer regulates synapse growth. In the current study, we far extended our previous study and systematically and mechanistically analyze the role of MacCer in promoting NMJ growth. Specifically, we defined a presynaptic function of MacCer by cell-type specific manipulation of MacCer level and revealed a new regulatory mechanism that MacCer promotes NMJ growth via Wg signaling. We have discussed the present data in the context of the previous study in subsection “GSL synthases Egh and Brn bi-directionally regulatesNMJ growth 104 presynaptically” and subsection “MacCer promotes NMJ bouton formation via Wg signaling”. We have provided experimental evidence supporting that MacCer acts as an adaptor for Wg to be localized to lipid rafts/recycling endosomes. As mentioned above, it has been well established that intracellular trafficking of LacCer/lipid rafts is mediated primarily via recycling endosomes. The lipid raft trafficking via recycling endosomes plays a crucial role in raft-associated signaling transduction (reviewed in Simons and Toomre, 2000). Our finding that MacCer enriched in Rab11-positive recycling endosomes implicates trafficking of Wg via recycling endosomes. To further support the binding of Wg and MacCer, we have added new data by a second methodology showing that wild-type Wg binds LacCer-beads whereas Wg carrying mutated GBM does not. These new data, in combination with our previous physical binding data (Figure 8), support a direct binding between MacCer and Wg via GBM. Furthermore, we have added new data that wgGBM mutation led to a decrease of co-localization between MacCer and Wg, without significantly affecting the synaptic level of MacCer (Figure 9). Our results together demonstrate that Wg GBM is critical for the interaction between Wg and MacCer, and that MacCer positively regulates Wg level, but not vice versa (also see the response to Figure 8 of this reviewer). The morphology of NMJ is indeed different between muscle 4 and muscle 6/7, but NMJ morphology in the same muscle from segments A2 to A4 is similar (Ballard et al., 2014; Chen and Ganetzky, 2012; Rodal et al., 2011; Zhao et al., 2015). We performed morphological analysis on NMJ4 as it is simple for quantification. NMJ6/7 terminal is larger with more boutons for electron microscopy and Futsch loop analysis. We indicated the use of specific NMJ for different experiments in Figure legends. We did not use any RNAi lines from the Vienna collection in this study. All the RNAi lines used in genetic screen (Supplementary file 1) are from Bloomington and Tsinghua RNAi center. We did not use RNAi lines for phenotypic analysis in Figure 1. In Figure 2 and Figure 3, we used brn RNAi knockdown to study its cell type specific function. The phenotypes of brn RNAi was reminiscent of that in brn mutants (Figure 2, Figure 2—figure supplement 1, Figure 2—figure supplement 2 and Figure 3), suggesting an efficient knockdown. We showed that the function of egh on NMJ growth is pre-synapse specific rather than synapse specific. We have added quantifications on NMJ boutons of all genotypes in Figure Supplements. We have added results of MacCer level at NMJ upon Filipin treatment. We have added Pearson Coefficient analysis of all colocalization results in Figure 6—figure supplement 1 and quantifications of Western results in Figure 6—Figure supplement 3. We have added representative images for MacCer and Fz2 staining in Figure 6—figure supplement 4 and representative images for Futsch staining of all genotypes quantified in Figure 6—figure supplement 2. To support the notion that the transport of Wg to synaptic terminals may be disrupted, we have added data showing that the level of Wg-HA in the neuropil of the ventral nerve cord was increased in egh mutants in Figure 6—figure supplement 3. In contrast, Wg-HA level in axons within segmental nerves of egh mutants was normal. Thus, there may be an axonal transport defect of Wg in egh mutants, but this point is beyond the scope of this study. The enlarged nerves in egh mutants are due to over-proliferation of glia and accumulation of immune cells (Dahlgaard et al., 2012). Dahlgaard et al., (2012) does not mention a possible axonal transport defect in egh mutants. To further support the binding of Wg and MacCer, we have added new pull-down data showing that wild-type Wg binds LacCer whereas Wg carrying mutated GBM does not in Figure 8. We also have added new in vivodata in Figure 9 showing a significantly reduced co-localization between MacCer and Wg in wg1/wgGBM mutant NMJs compared to that in both wild type and wg1/+ heterozygous control. Although we could not direct examine homozygous wgGBM mutants which are embryonic lethal, the comparison between wg1/+ heterozygous and wg1/wgGBM mutant effectively revealed the effect of wgGBM allele on Wg-MacCer co-localization. We did not claim that wg GBM mutant would affect lipid rafts via disrupted MacCer binding. Instead, we showed that MacCer level and staining pattern at NMJs in wg1/wgGBM and wg1/wgCX4mutants were not changed compared to that of wg1/+ heterozygous and wild-type control (Figure 9 and Figure 6—figure supplement 4). Together, our data show that MacCer positively regulates Wg level at NMJs, but not vice versa. […] Overall, while the topic is interesting, several data sets are over-interpreted, and controls are missing. The paper tries to make many points, but the data is lacking for some parts of their model. This is particularly true for the claims on SL synthesis (like Figure 1), as well as the concept that MacCer is active in lipid rafts and/ or endosomes. On the other hand, there is considerable data on the point that Egh (MacCer) genetically interacts with Wg and affects presynaptic Wg signalling – though again the manuscript falls short of convincingly proving a direct physical interaction (Figure 8). We have toned down the statements regarding sphingolipid synthesis and lipid rafts results. We have rephrased the title of sphingolipid synthesis result to “Mutations in de novo sphingolipid synthetic enzymes affect NMJ growth”. GSLs are critical raft-components and used as molecular markers for membrane lipid rafts (reviewed in Simons and Gerl, 2010). It has been well established that lipid rafts/LacCer (the vertebrate analog of MacCer) are enriched in recycling endosomes (Balasubramanian et al., 2007; Gagescu et al., 2000; Hortsch et al., 2010). These references have added in the revision (also see the response to the last point of this reviewer). Our result that MacCer co-localizes with Syx1A and Rab11 is consistent with the concept that MacCer is part of lipid rafts and enriched in recycling endosomes. We have carried out a lipid pull-down assay which shows a direct binding between Wg and LacCer (revised Figure 8). We agree that many molecules and pathways converge to affect NMJ growth (reviewed in Harris and Littleton, 2015). To identify which pathway is directly regulated by MacCer, we have examined a few molecules and pathways that are known to regulate NMJ growth. TGF-β/BMP is an important retrograde growth promoting signaling in NMJs. We previously reported that the NMJ growth-promoting effect of MacCer is not dependent on this signaling pathway (Huang et al., 2016). In this revision, we have added new data showing a normal expression of important synapse regulators such as FasII and Syx1A at egh mutant and brn-overexpression NMJ (Figure 3—figure supplement 1). Instead, our substantial data (Figures 7–9) support that MacCer acts as an adaptor for Wg to facilitate Wg signaling at NMJ synapses. 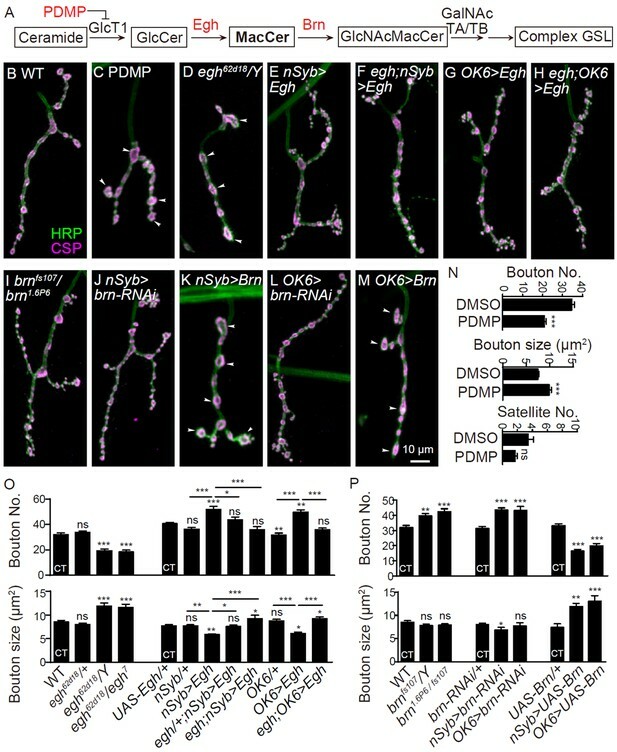 Our new results from motoneuron specific manipulation of gene expression by OK6-Gal4 support that GSL synthase Egh and Brn regulate NMJ growth in presynaptic neurons but not glia or postsynaptic muscles (Figure 2 and Figure 3). In addition to the neuronal specific role of Brn, we showed that neuronal co-expression of Brn and Wg driven by nsyb-Gal4 regulates NMJ growth, suggesting an interaction between MacCer and Wg presynaptically. As far as we know, we are the first to use the two drugs in Drosophila larvae. We tried the two drugs in various concentrations. Treatment with a high concentration of MβCD and Filipin led to embryonic lethality. Therefore, we selected a low concentration of drugs that affected NMJ development without apparent larval growth defects. We have added description on larval size, developmental time, and muscle size upon drug treatment in the revision (Figure 4—figure supplement 1). We agree that depletion of sphingolipids or sterols by drug or genetic means is expected to have a general effect on the whole animal, but the effect seems to be specific on NMJ growth based on our assays (Figure 4 and Figure 5 and associated supplements). As suggested by the reviewer, we have carried out pull-down assay which shows that Myc-Wg binds with LacCer whereas Myc-Wg containing mutated GBM does not (Figure 8G). We also have added new in vivodata in Figure 9 showing a significantly reduced co-localization between MacCer and Wg in wg1/wgGBM mutant NMJs compared to that in both wild type and wg1/+ heterozygous control. We believe these new results together with our previous membrane lipid binding data in Figure 8 (D–F) support a direct binding between MacCer and Wg via GBM. We provided experimental evidence that MacCer co-localizes with recycling endosome marker rab11 at the presynaptic NMJ terminals (Figure 6). Localization of lipid rafts/LacCer to recycling endosomes has been firmly established in the literature. For example, fluorescence labeled LacCer is enriched in recycling endosomes in human and Drosophila cells (Hortsch et al., 2010). Similarly, recycling endosomes purified from Madin-Darby canine kidney cells are enriched in raft-resident lipids and raft-associated proteins (Gagescu et al., 2000). These two references have been added in subsection “MacCer facilitates local presynaptic Wg signaling at NMJs” and subsection “MacCer promotes synaptic growth via presynaptic Wg signaling” in the revision. […] The generation of the GBM Wingless mutant via CRISPR is an excellent new tool for the investigators to further explore the role of Wg-GSL interactions in Wg function. While I acknowledge that extensive characterization of this new allele is beyond the scope of this study, a few more experiments are necessary to test their hypothesis. First, the authors should examine bouton size in Wg[GBM/1] animals as they have done in previous figures to determine if this phenocopies mutants that cause reduction of MacCer. Second, the authors should show that these phenotypes can be rescued by presynaptic expression of wildtype Wg. Finally, it would be of great interest to determine if the Wg[GBM/1] phenotype is modulated by egh and brn genetic manipulations as was performed in prior figures. If the Wg[GBM/1] phenotype is epistatic to brn and egh as would be predicted by the model, an insensitivity of this GBM allele to MacCer levels would be strong genetic evidence that these GSLs are regulating synaptic development through Wg. As the reviewer suggested, we have added the data showing that wgGBM/wg1 mutants show fewer and larger synaptic boutons (Figure 9J and N), recapitulating the phenotype of MacCer deficiency egh mutants. TheNMJ undergrowth phenotype in wgGBM/wg1 mutants was rescued by presynaptic expression of Wg (Figure 9, K and N). The NMJ phenotype of wgGBM/wg1 (wg1 is a hypomorph mutation) was insensitive to the increased level of MacCer, supporting that Wg is epistatic to MacCer (Figure 9, L and N).Based on early lethality of wgGBM/wgGBM and wgCX4/wgGBM, and similar NMJ phenotype of wgGBM/wg1 and wgCX4/wg1 (Figure 5 and Figure 9), we assume that wgGBM behaves as a genetic null as wgcx4. egh is thought to be a single copy gene without apparent homologues capable of providing functional redundancy based on sequence analysis (Wandall et al., 2003; Wandall et al., 2005). egh62d18 mutation carries an 11 bp deletion which causes a frameshift at amino acid 97 resulting in most of the protein sequence (458-97 amino acids) not expressed; thus, it is presumably a null (Wandall et al., 2005). The change of MacCer intensity was indeed modest (Figure 3B). This is because of non-specific background staining in egh nulls, residual MacCer produced in egh mutants by an alternative approach, or both. For Figure 8—figure supplement 1C, we rephrased it into “egh62d18 mutants lacked MacCer while brn1.6P6 mutants contained primarily MacCer” in the revision. In Figure 2L, the authors show that brn[fs107/Y] mutants have a significant increase in bouton no. Presumably, this is compared with WT male larvae, though the control should be explicitly stated. What is the WT strain used, and is it the appropriate genetic background control? In Figure 2, which egh allele is used in the rescue experiments? w1118 was used as the wild-type control in this study, as in Materials and methods section. w1118 is widely used as wild-type control in NMJ studies by many laboratories, including that of Vivian Budnik, Graeme Davis, Barry Ganetzky, Patrik Verstreken (Ballard et al., 2014; Kerr et al., 2014; Khuong et al., 2010; Pielage et al., 2011; Zhao et al., 2015). We used both male and female w1118 as control because gender does not significantly affect the NMJ growth. The genotype of egh rescue experiment in Figure 2 was egh62d18/Y; UAS-Egh/+; nsyb-Gal4/+. 1) What is the impact of MacCer localization in lipid rafts on interaction with Wg? Previous reports show that MacCer (short for mannosylglucosylceramide) and Wg (through its acylation) are enriched in lipid raft domains of membrane by biochemical fractionation (Rietveld et al., 1999; Zhai et al., 2004). Our study revealed a colocalization of MacCer and Wg at presynaptic NMJs (Figure 6A), consistent with direct physical binding of MacCer and Wg (Figure 8). We have added detailed discussion of the impact of lipid raft on MacCer-Wg interaction in the revision in subsection “MacCer promotes synaptic growth via presynaptic Wg signaling”. 2) The authors only detect internal signal with the MacCer antibody to examine lipid rafts at NMJs. In addition to MacCer staining, we also stained NMJs with an antibody against Syx1A (Figure 4A), a protein marker of lipid rafts (Chamberlain et al., 2001). The Syntaxin 1A puncta substantially overlapped with MacCer puncta with or without colocalization with HRP-positive plasma membrane (Figure 4A), confirming the presence of lipid rafts at NMJs. 3) It feels like an over-interpretation about the genetic results on the basis that the double manipulation is similar to sterol or MacCer loss alone. In addition to the observation that depleting sterol with MβCD could not exacerbate the NMJ undergrowth in MacCer-deficient larvae, we also showed that MβCD fully restrict the NMJ overgrowth in MacCer-excessive larvae to the level of MβCD-treated wild-type larvae (Figure 4G and Figure 4—figure supplement 1F). We have added these results in the revised text in subsection “MacCer promotes NMJ bouton formation in alipid raft-dependent manner”. We agree that pharmacological approaches may have other effects rather than just affect lipid rafts. Thus, we toned down the conclusion that sterol may modulate NMJ growth in a common genetic pathway with sphingolipids and MacCer. 4) The authors suggest that lipid rafts have some impact on MacCer function, without further elucidating on what this might be. The restriction of synaptic growth upon lipid rafts disruption may be due to Wg de-localization from lipid rafts rather than a reduction in the synaptic level of MacCer per se. Lipid raft disruption de-localizes Wg from the rafts evidenced by biochemical fractionation (Zhai et al., 2004); delocalization of Wg disrupts its accessibility and binding to MacCer, compromises its transport to the NMJ terminals (Figure 5—figure supplement 1 L-N), and in turn restricts NMJ growth. We have added these arguments in the revision (see subsection “MacCer promotes synaptic growth via presynaptic Wg signaling”). 5) Why does MacCer staining remain punctate even after lipid rafts are disrupted by sterol depletion? It is reasonable to expect that MacCer would diffuse or appear less punctate upon lipid raft disruption. The microscale MacCer puncta in our assays are not representing single nanoscale lipid raft assemblies. It is thus possible that the formation dynamics of the nanoscale lipid rafts could not be discerned by confocal microscopy, as the nanoscale microdomains are below the optical resolution limit set by the light diffraction (Eggeling et al., 2009; Simons and Gerl, 2010). This possibility is consistent with a previous finding that upon sterol depletion by MβCD, the localization of a raft protein LFA-1 was unaltered examined by confocal microscopy at subcellular level but altered by single-molecule near-field optical microscopy at molecular level (Van Zanten et al., 2009). This point has been added in the revised Results section. In addition to MacCer immunostaining, high performance thin layer chromatography (HPTLC) analysis also showed that egh62d18 mutants lacked MacCer and brn1.6P6 mutants contained almost exclusively MacCer (Figure 8—figure supplement 1; Hamel et al., 2010; Wandall et al., 2005). A few mutants with altered NMJ morphology show normal synaptic MacCer levels, including desat1 (Huang et al., 2016), rab11, wg1/wgCX4 (Figure 6—figure supplement 4 A-D) and wg1/wgGBM (Figure 9 A-D) mutants. Based on these staining results of mutants and overexpressing linesof egh and brn, we are confident that the anti-MacCer staining is specific. We have added related description in subsection “GSL MacCer promotes NMJ growth” of the revision. It is a legitimate question whether the binding partners of MacCer would affect the antibody accessibility to MacCer. Based on our results, Wg does not affect MacCer immunoreactivity, as wg mutation does not alter MacCer intensity at NMJ (Figure 6—figure supplement 4 A-D andFigure 9A-D). © 2018, Huang et al.